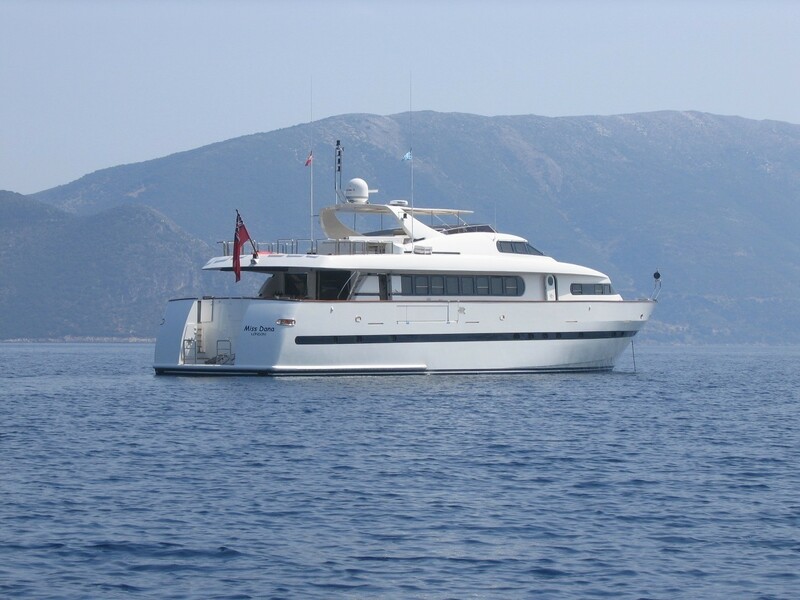 Motor yacht PROJECT STEEL (ex Miss Danna) was designed by naval architect Vincenzo Ruggiero and built by Bugari shipyard, in 1993. 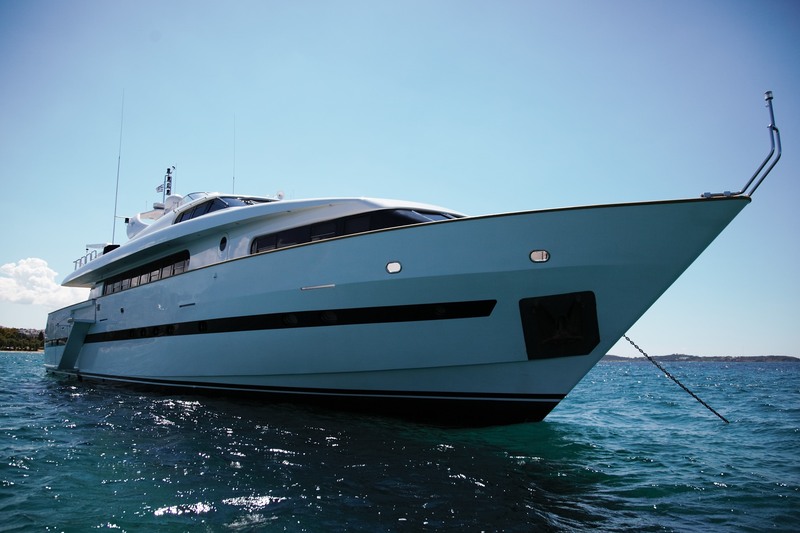 The yacht received refits in 2007 and 2014. 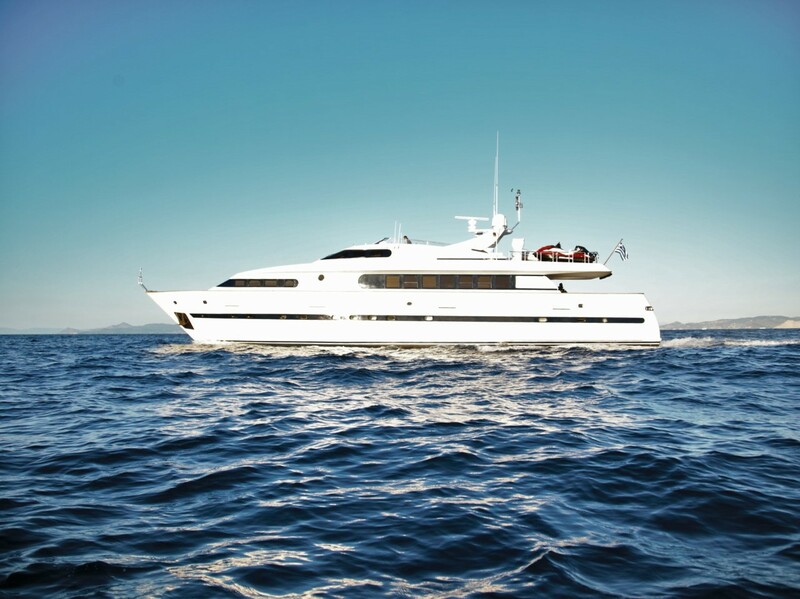 M/Y PROJECT STEEL is an ideal choice for families and groups of friends, offering accommodation for up to 12 guests in 5 cabins. 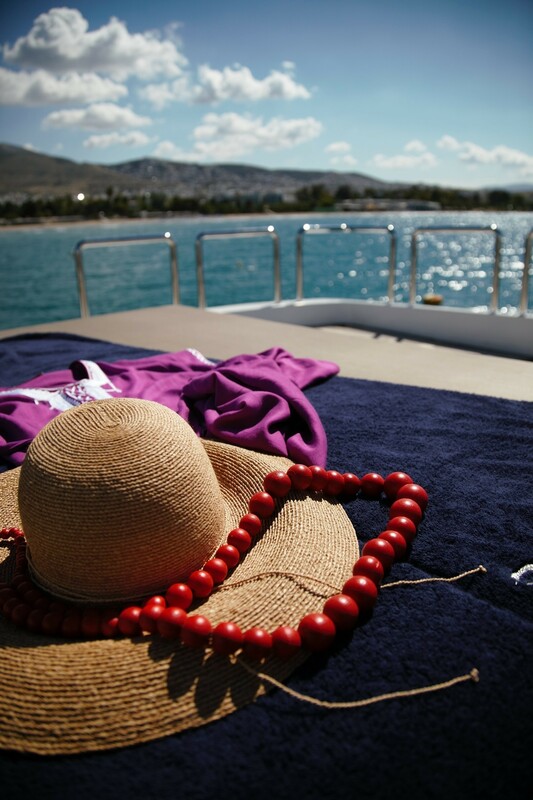 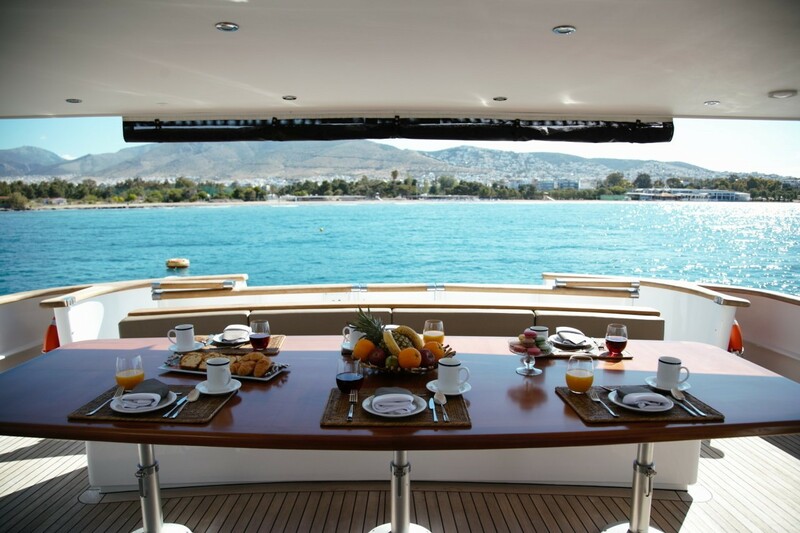 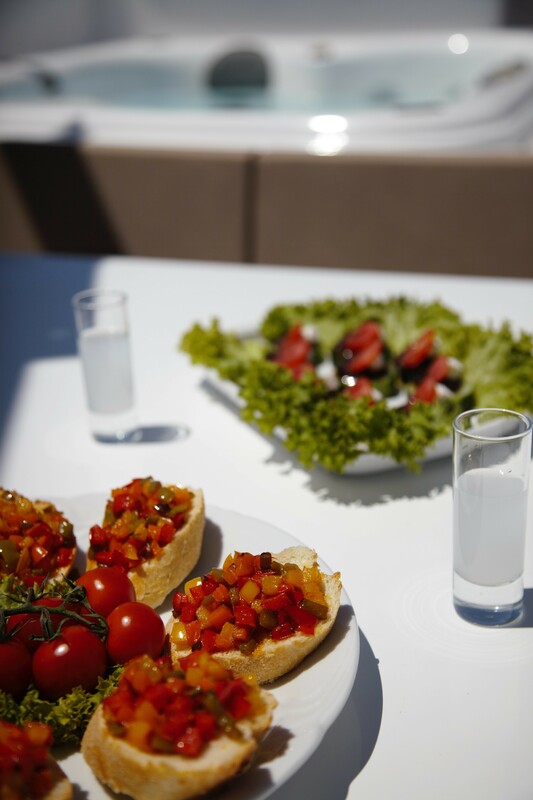 Her contemporary interior décor and ample exterior living areas are perfect for luxury crewed yacht charters in the idyllic Greek waters. 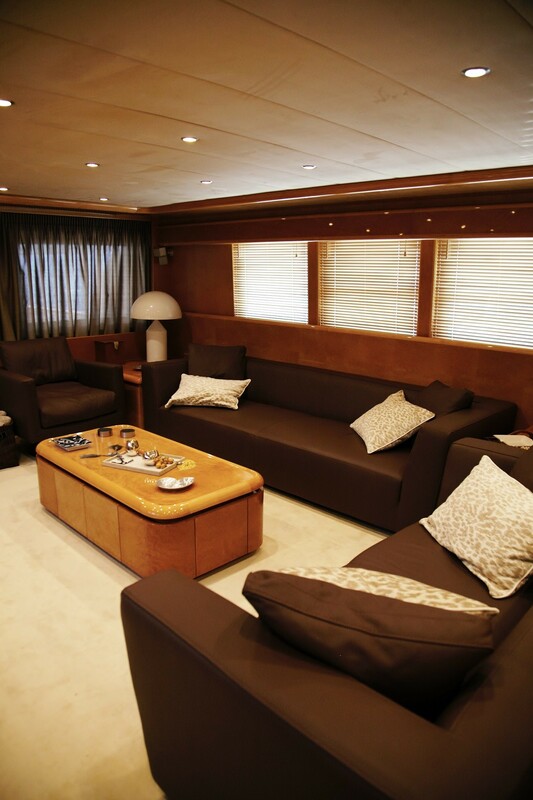 PROJECT STEEL features a neutral interior of modern earth toned soft furnishings, warm wood panels and subtle cream carpets and headliner. 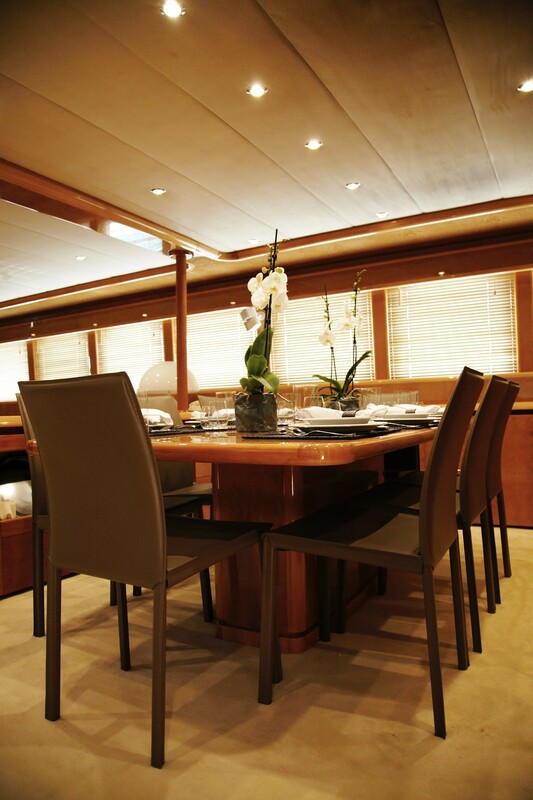 The salon and dining is an open plan, offering a generous lounge aft and full beam formal dining table forward. 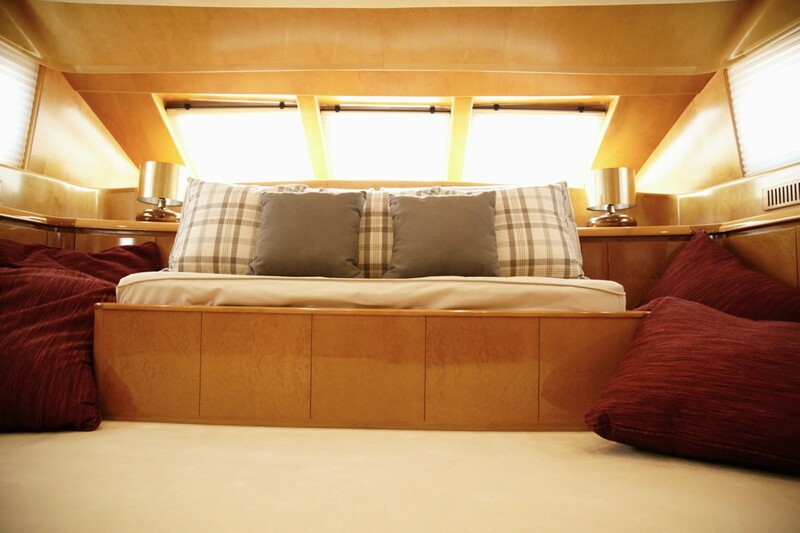 Surrounding windows provide plenty of natural light, creating an open airy ambiance. 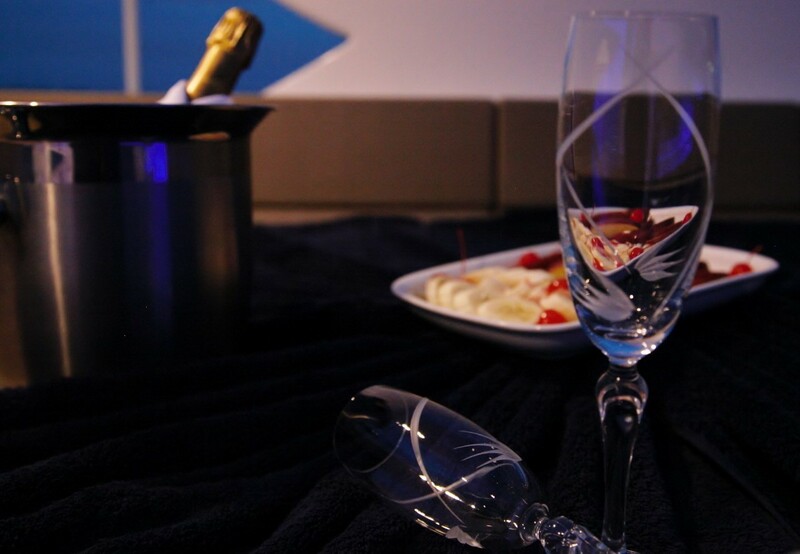 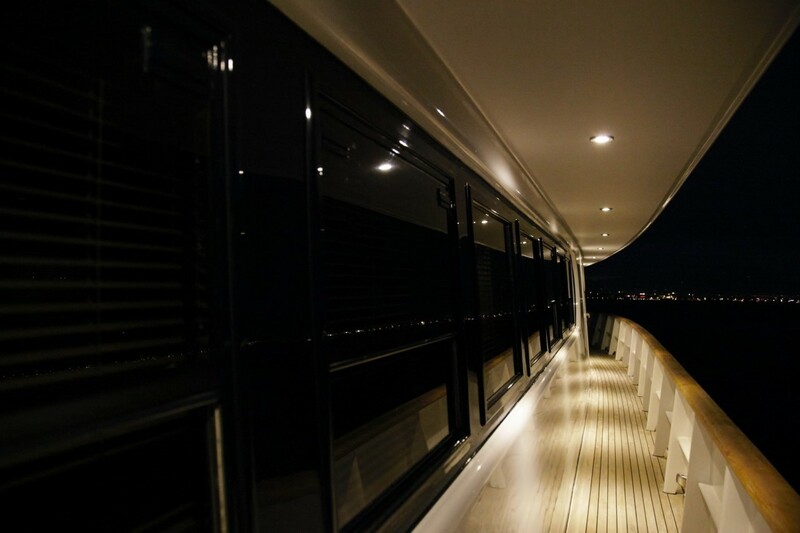 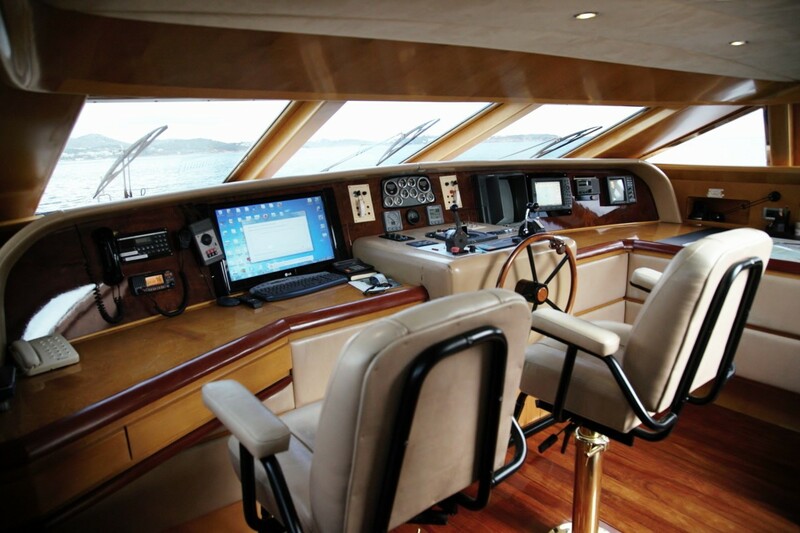 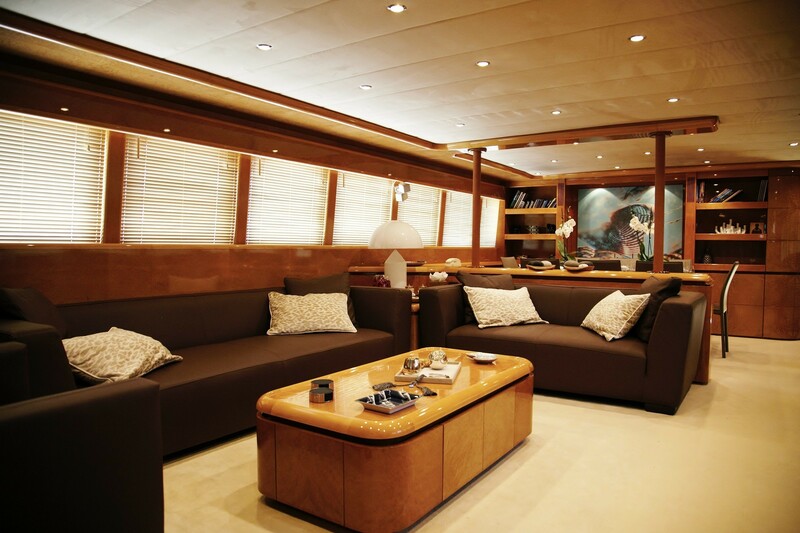 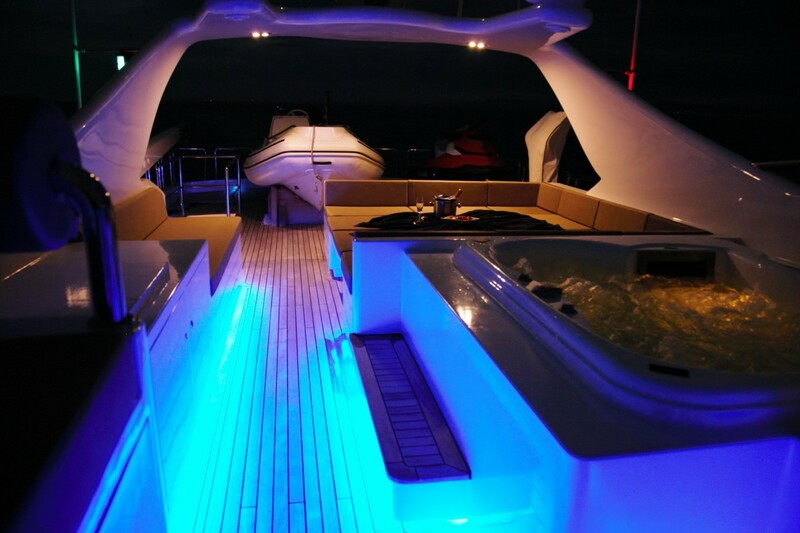 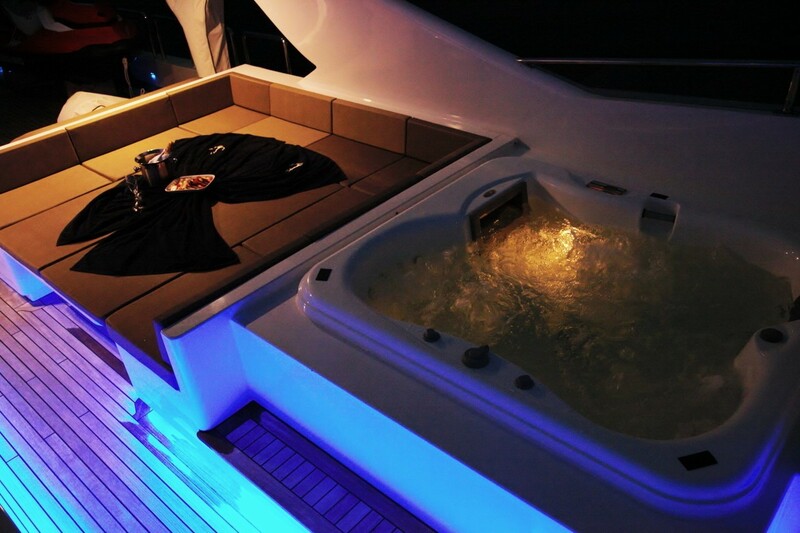 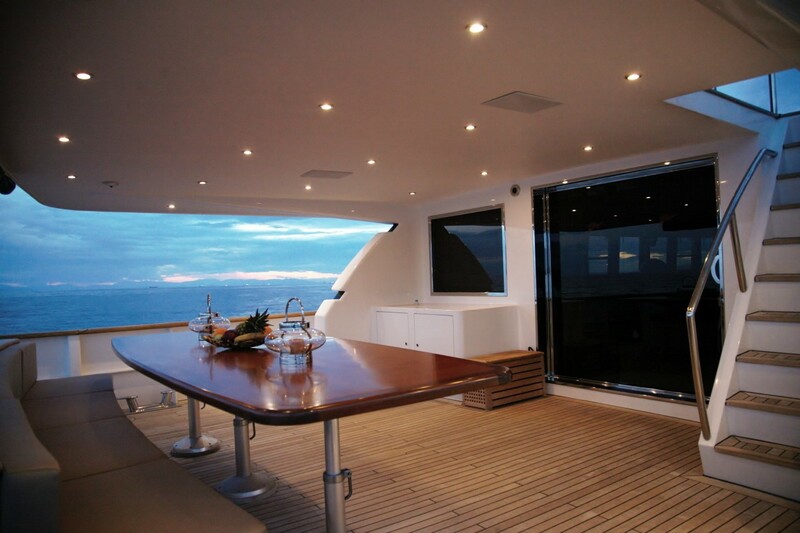 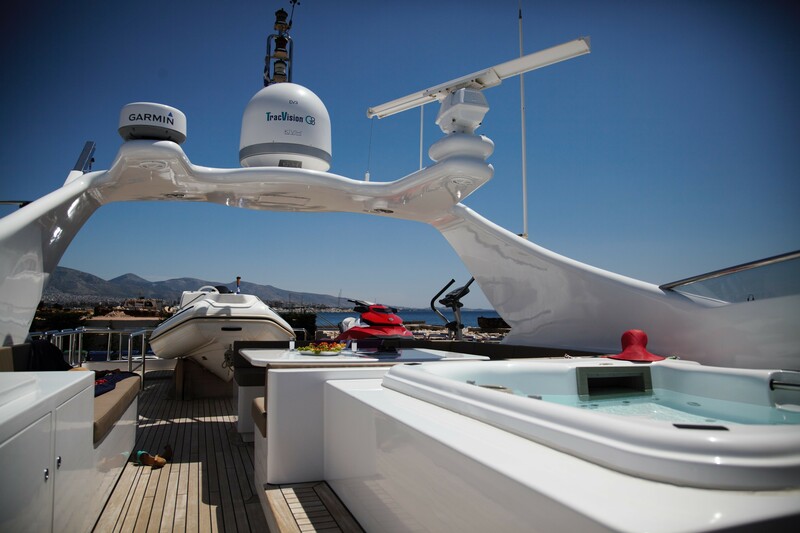 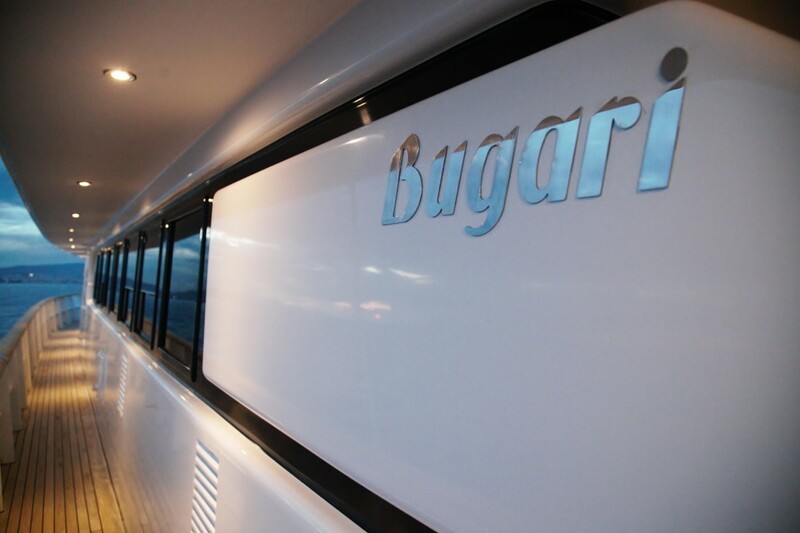 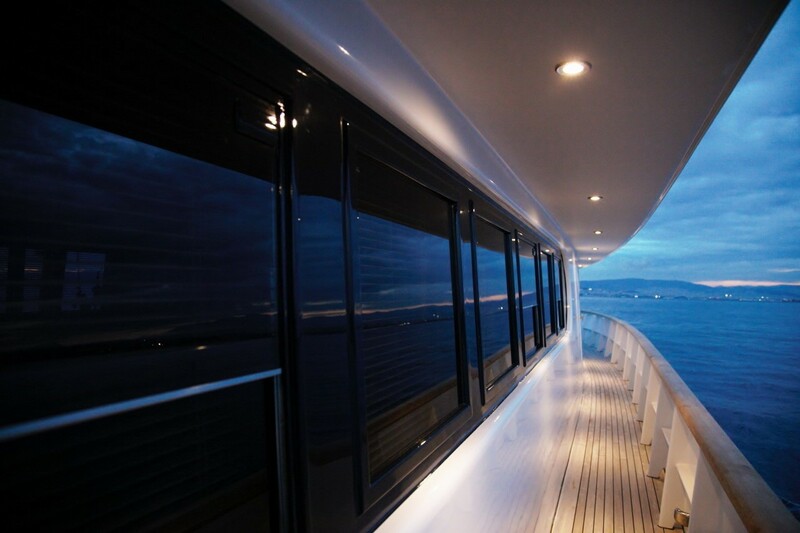 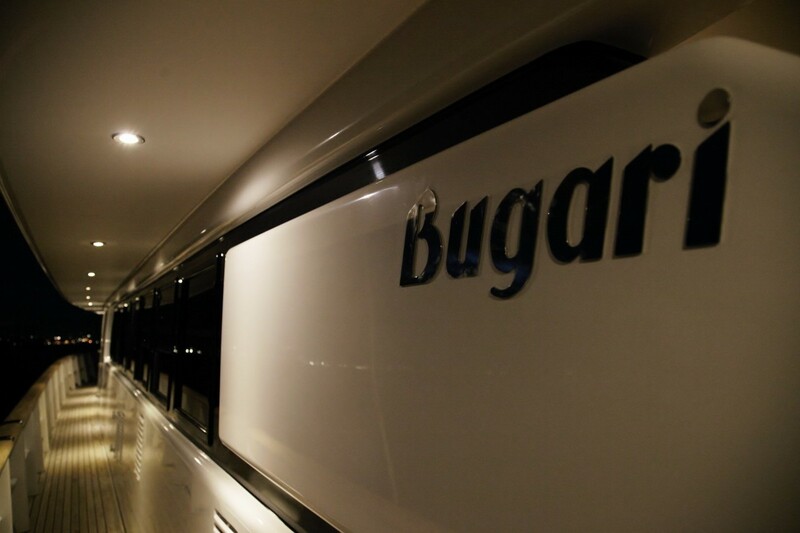 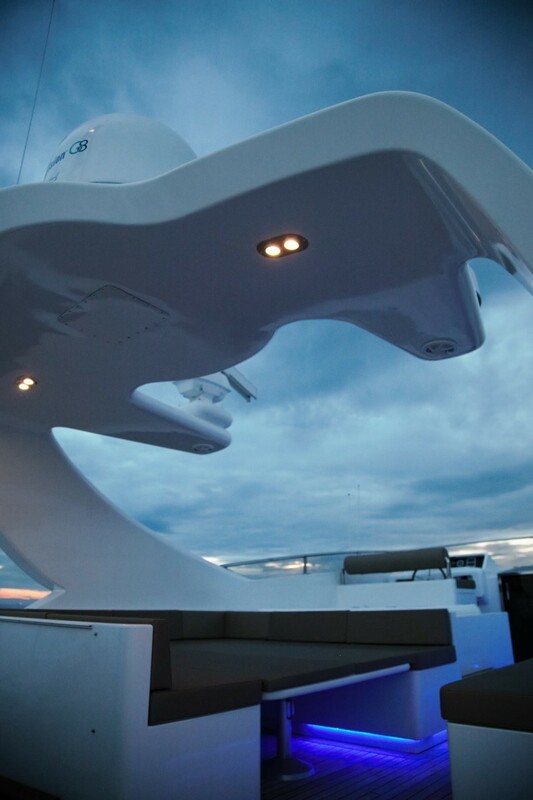 Further forward, the VIP suite is on the main deck, full beam of the yacht. 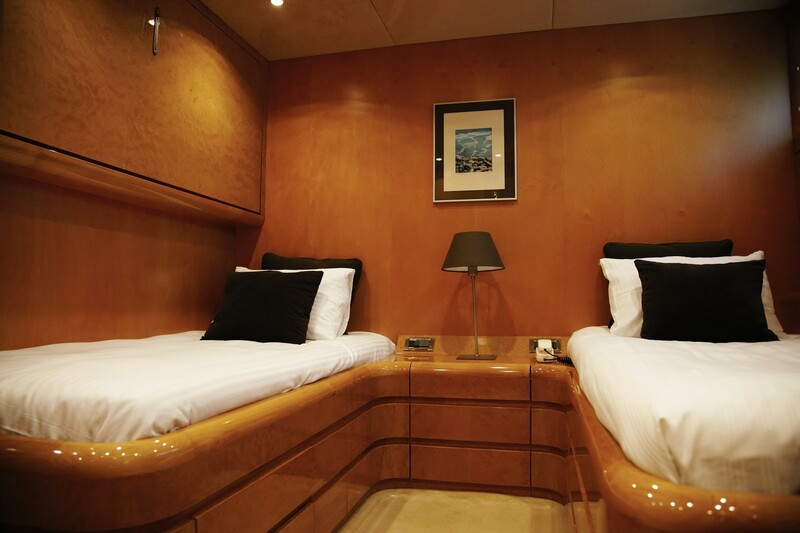 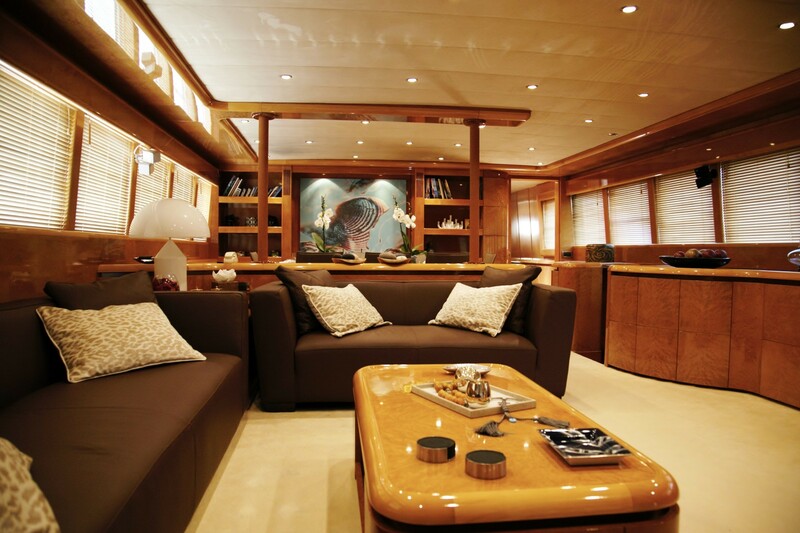 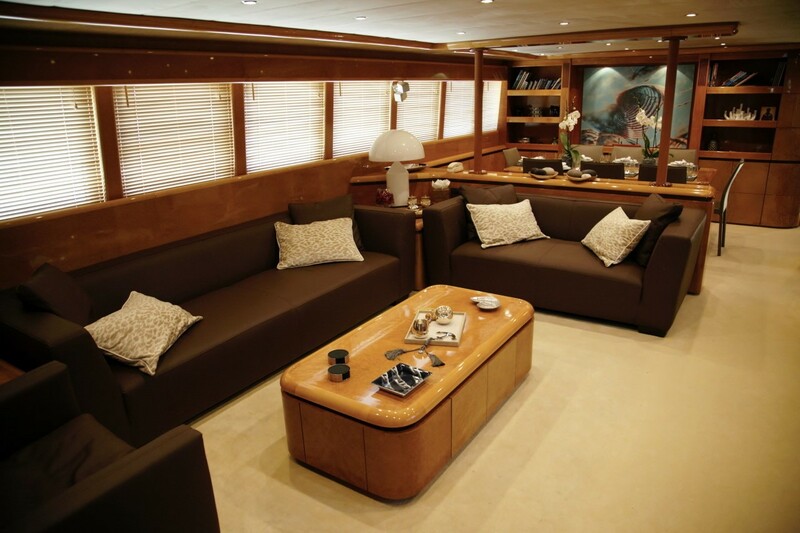 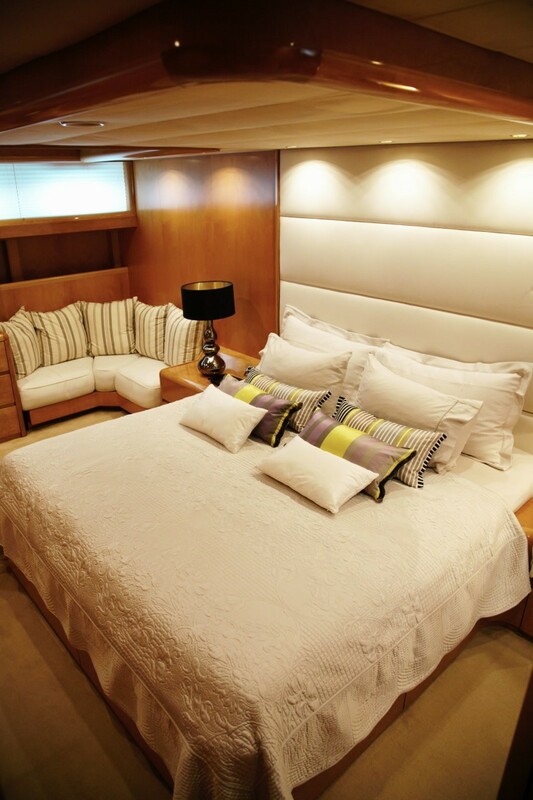 Below decks, the full beam master suite is amidships, with a further double cabin and 2 twin cabins. 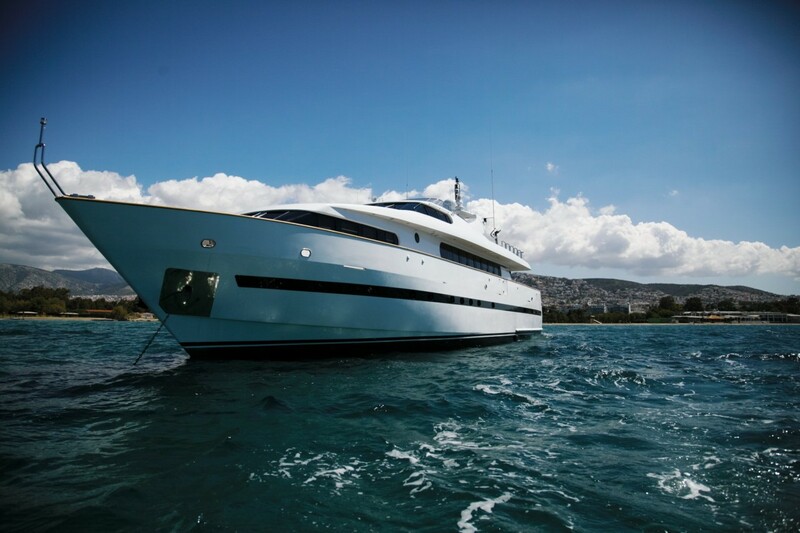 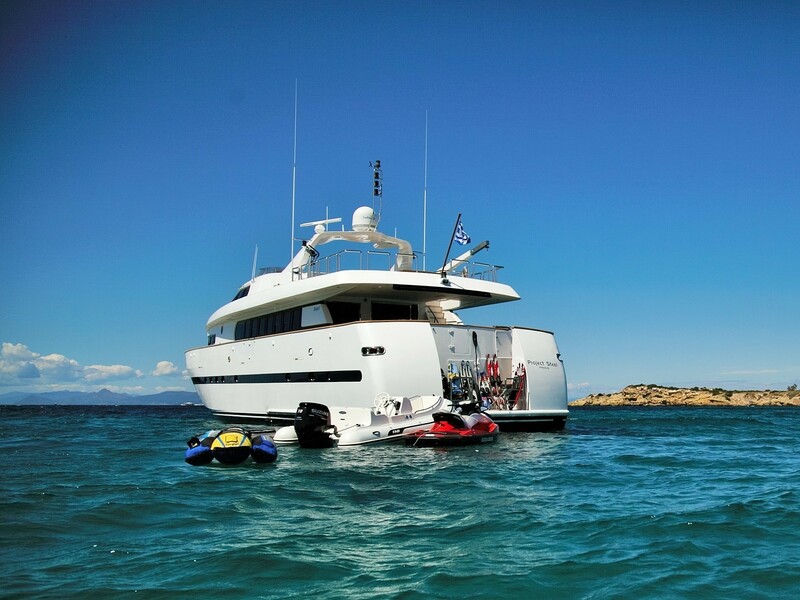 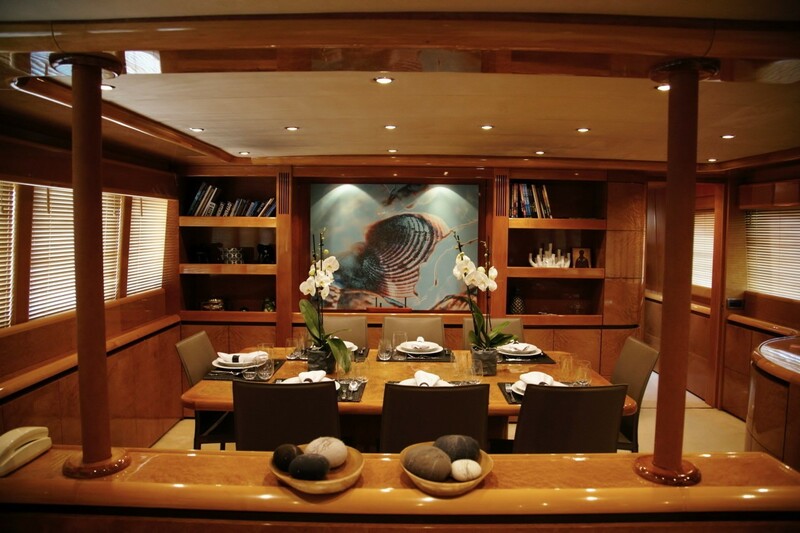 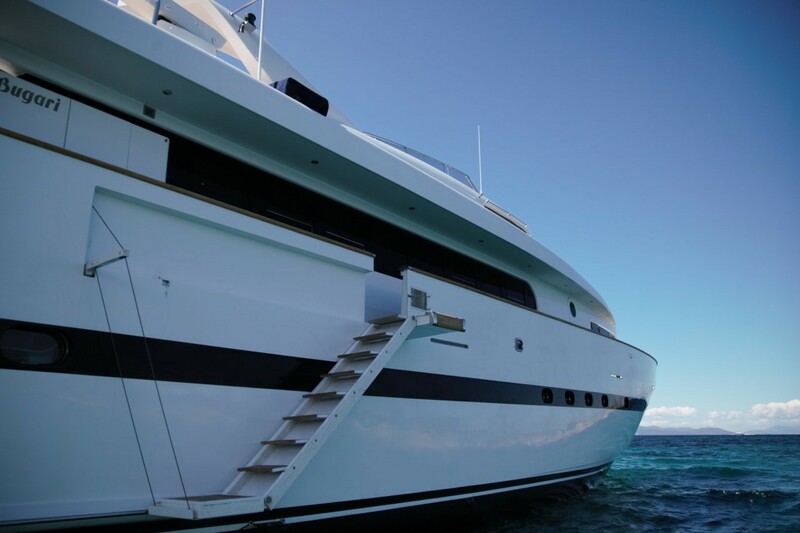 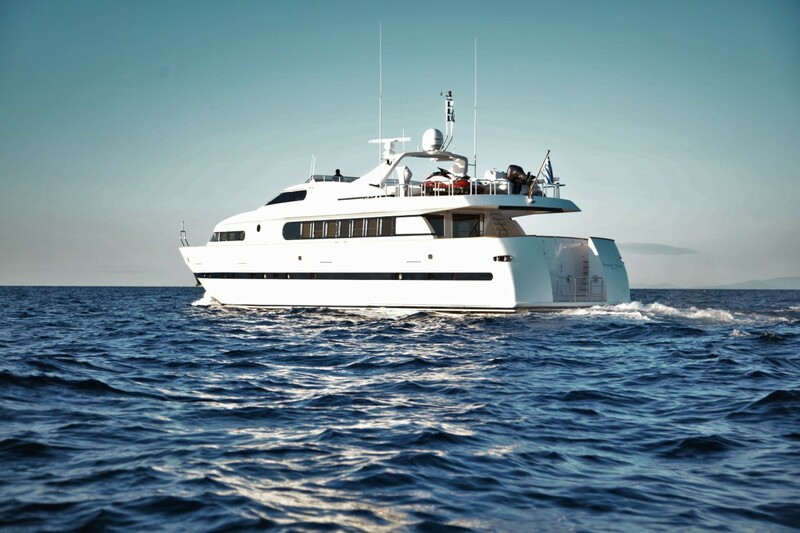 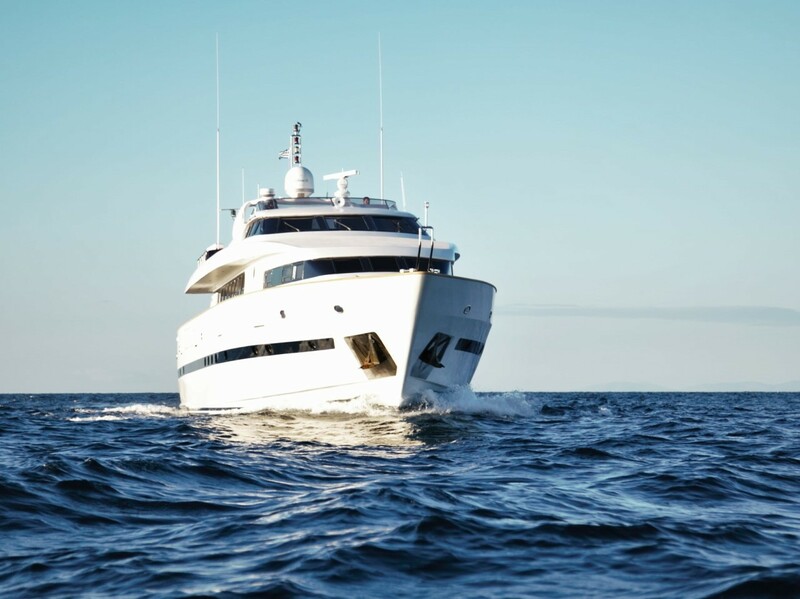 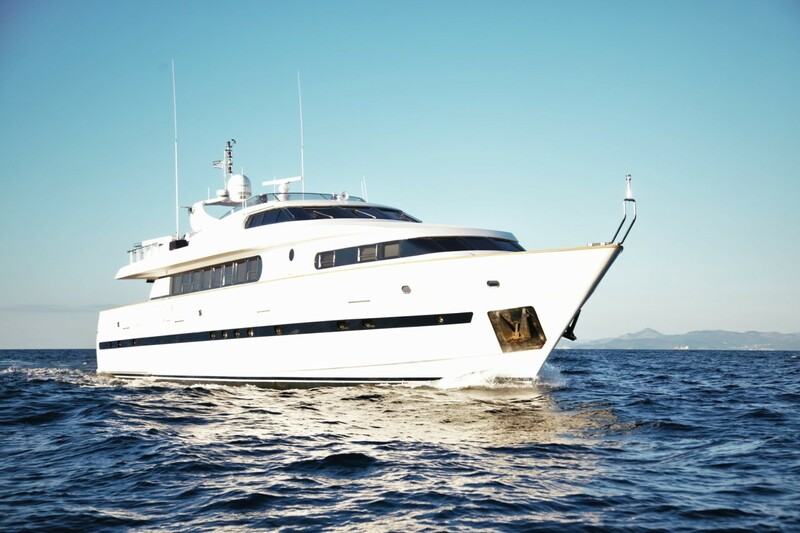 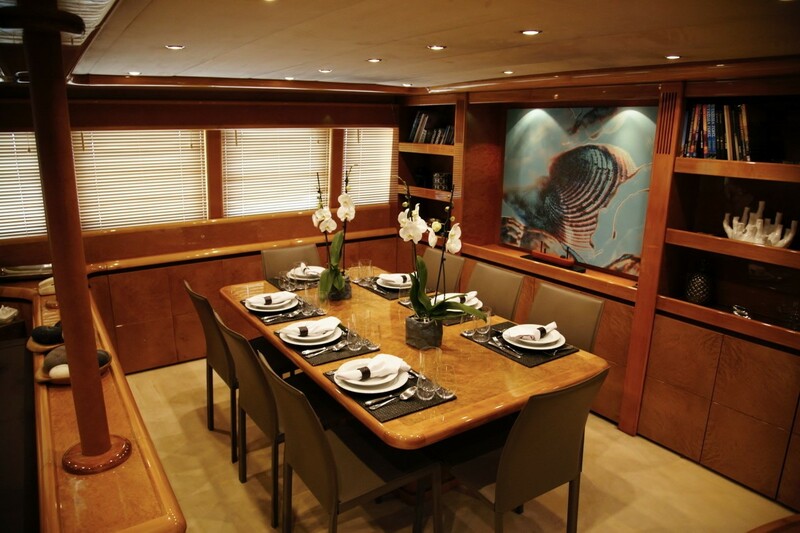 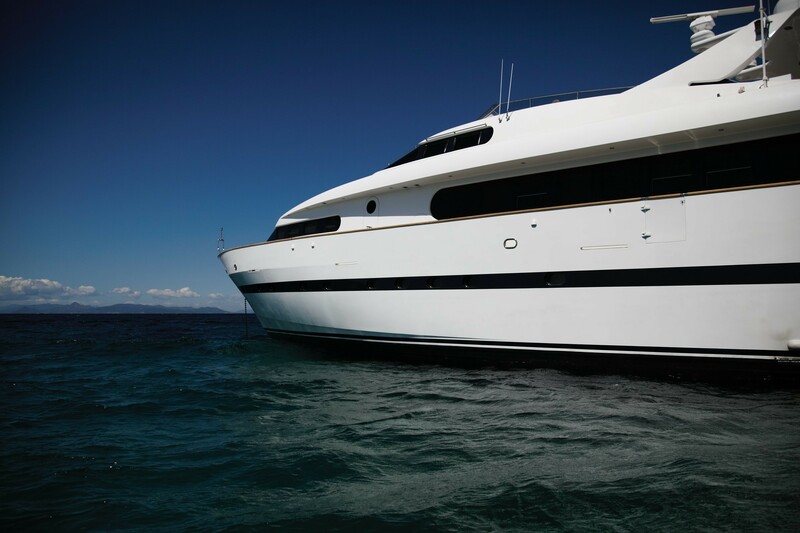 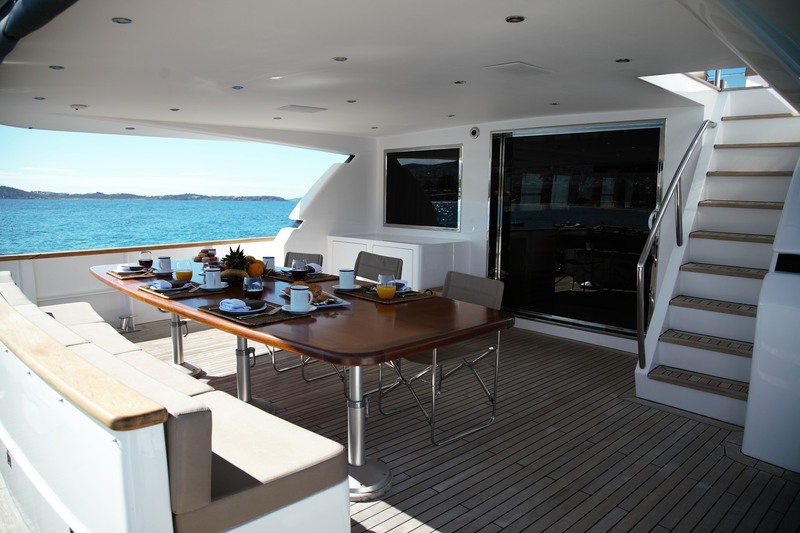 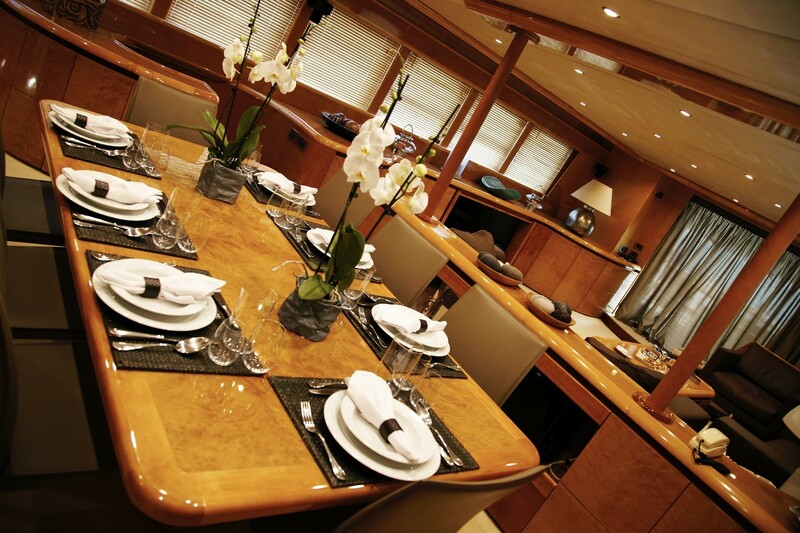 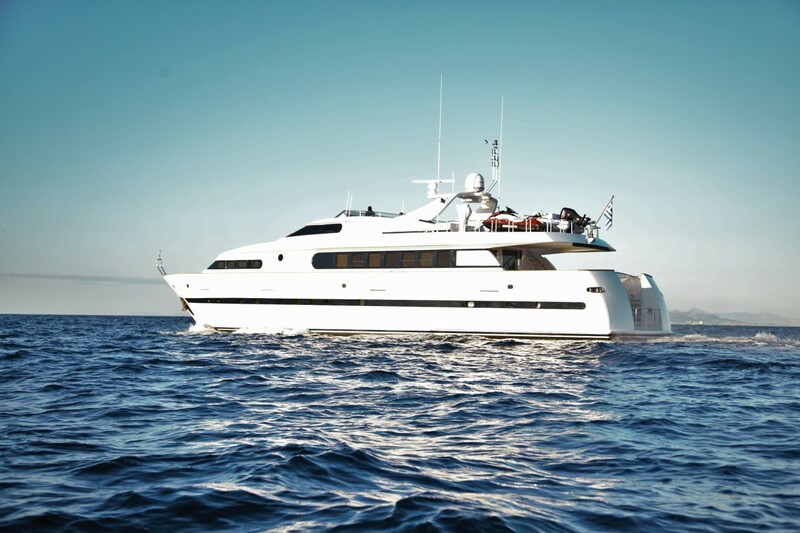 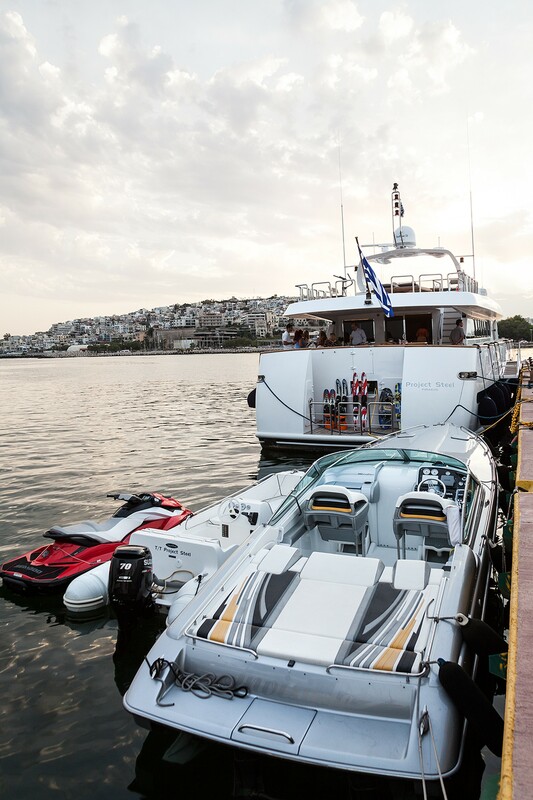 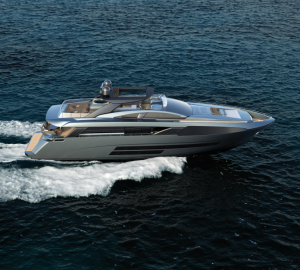 The PROJECT STEEL motor yacht boasts spacious exterior living, great for entertaining. 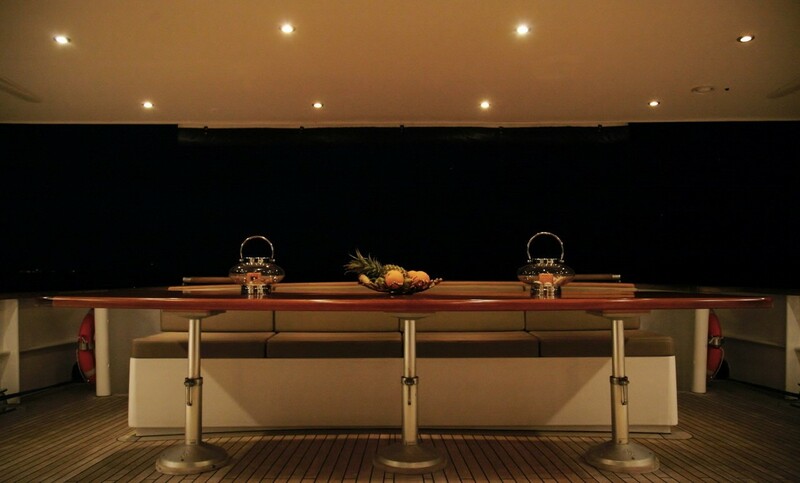 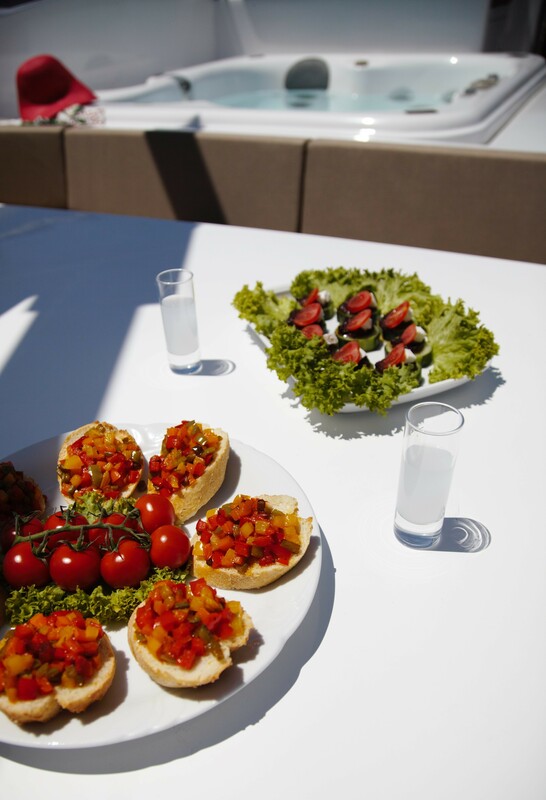 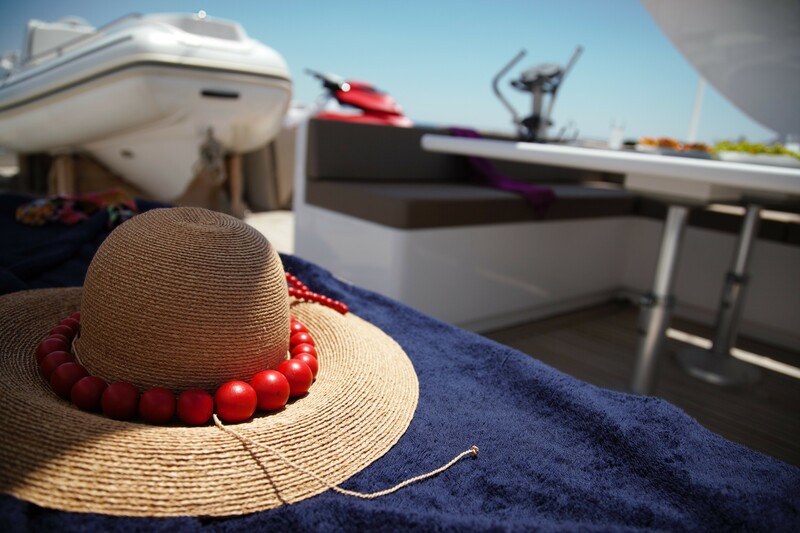 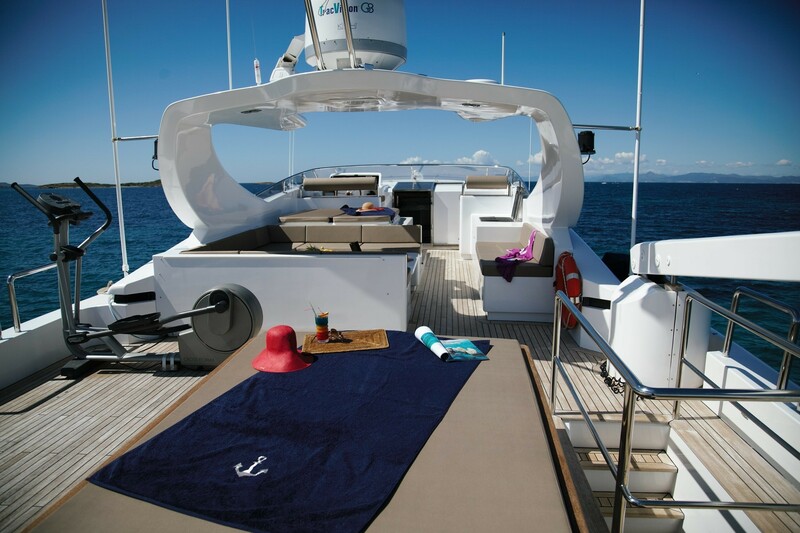 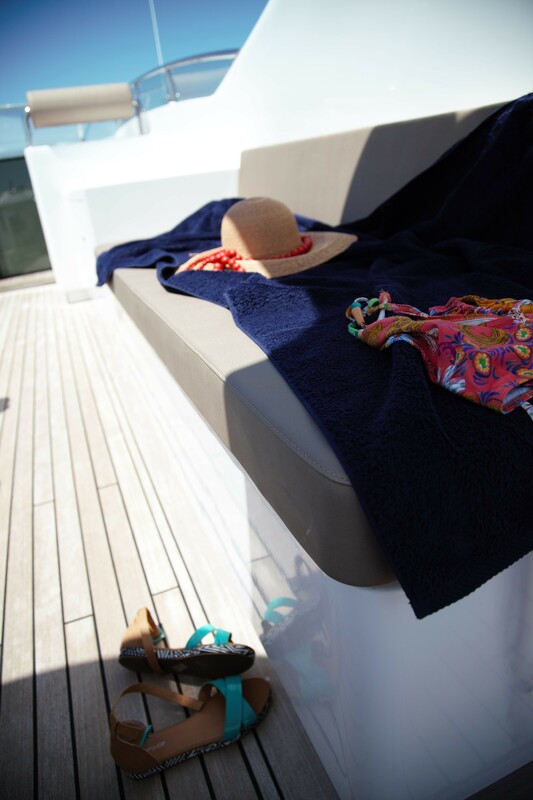 The aft deck is adjacent to the salon and shaded, offering a comfortable seating area and alfresco dining option. 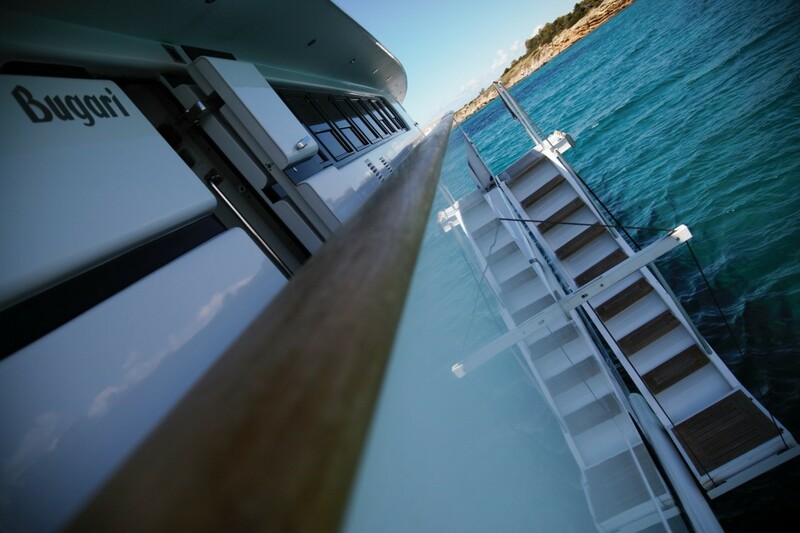 The main deck continues forward on port and starboard, leading to an additional seating area with cocktail table, perfect for an evening aperitif, or relaxed board game. 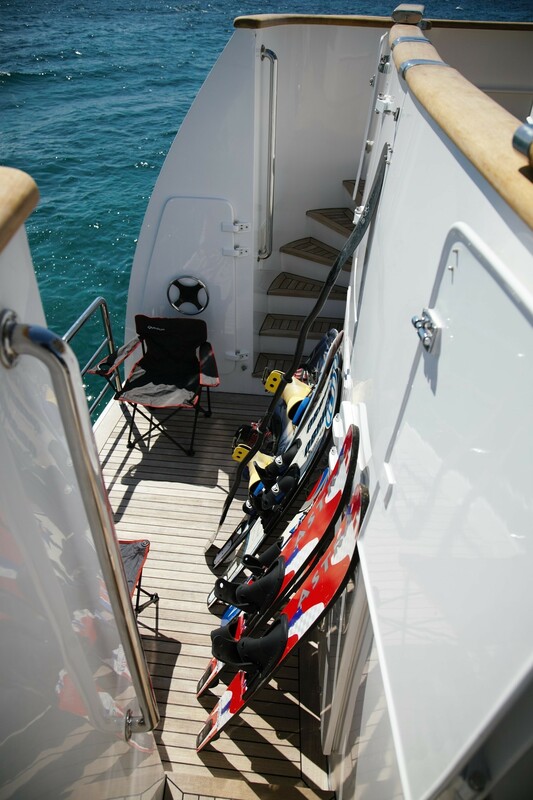 An upper deck is well-appointed and ideal for any occasion. 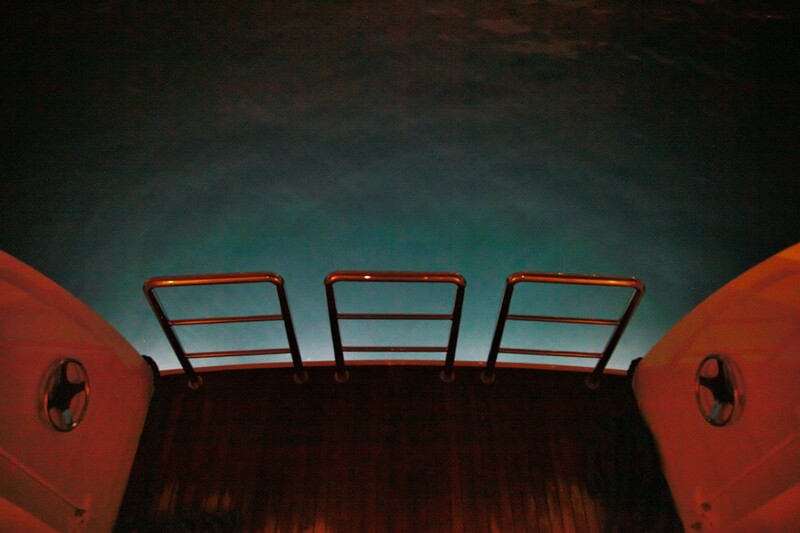 Here guests may dine alfresco, soak up the sun on the large sunpad or take a soothing dip in the Spa Pool. 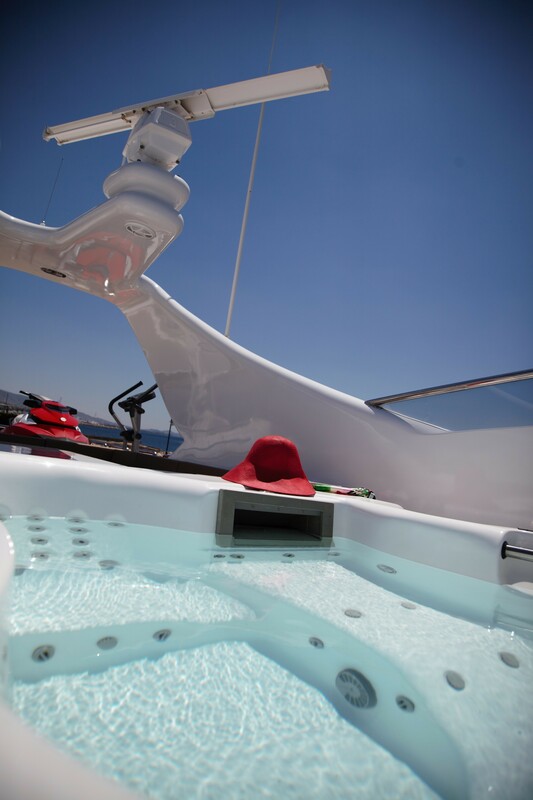 Water enthusiasts will be pleased with the generous inventory of water toys, all easily accessed from the extended swim platform. 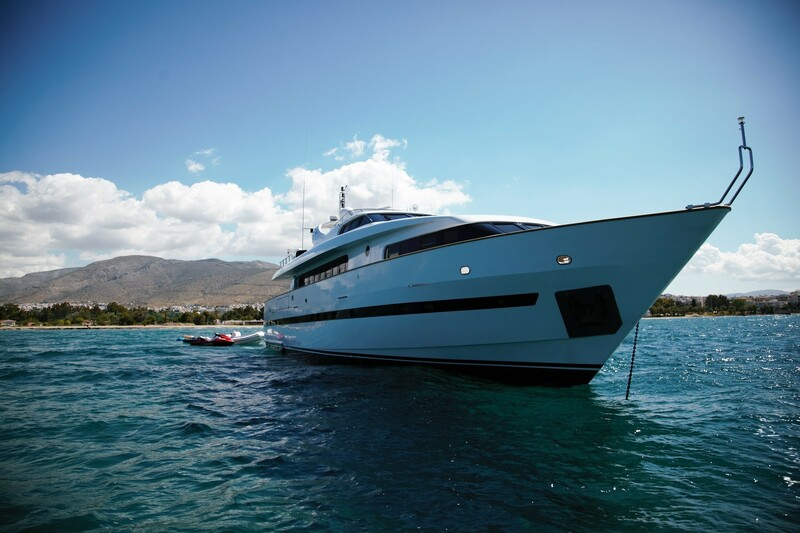 Powered by 2 CAT 630hp engines, luxury motor yacht PROJECT STEEL cruises effortlessly at 11 – 13.5 knots. 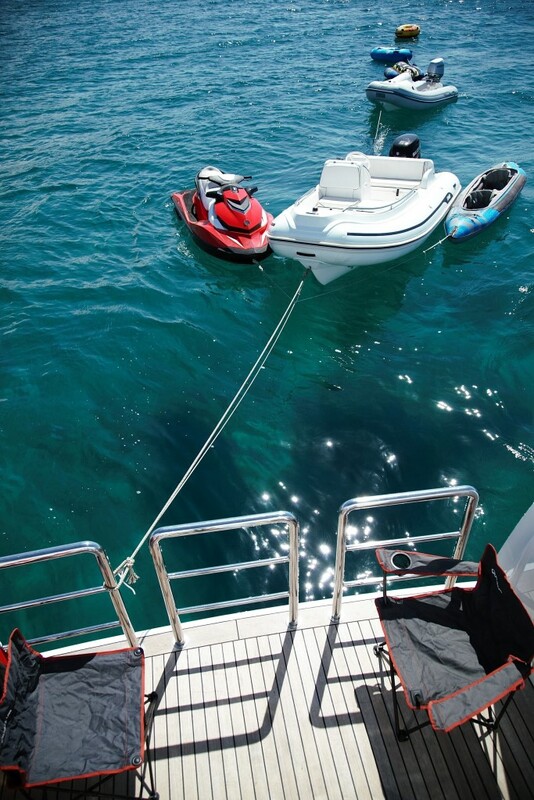 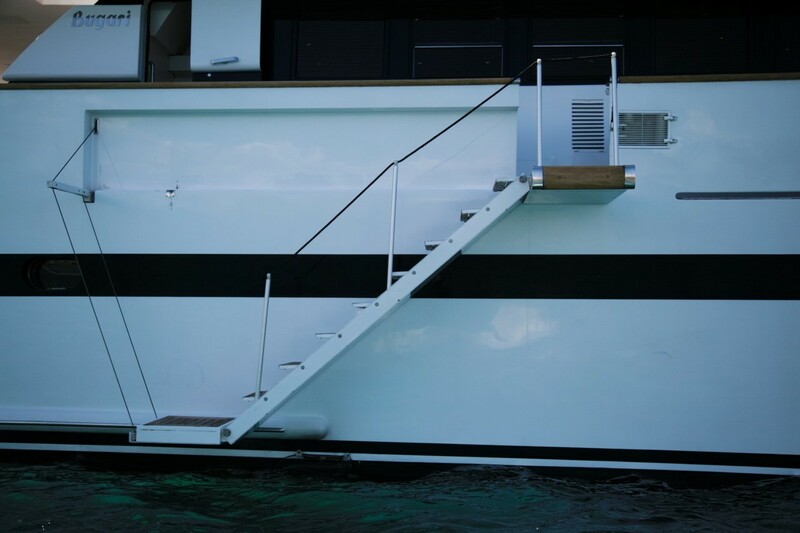 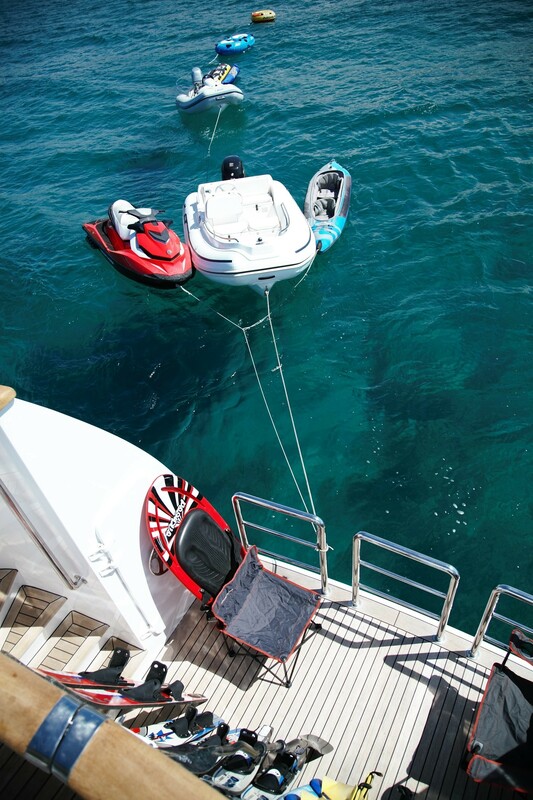 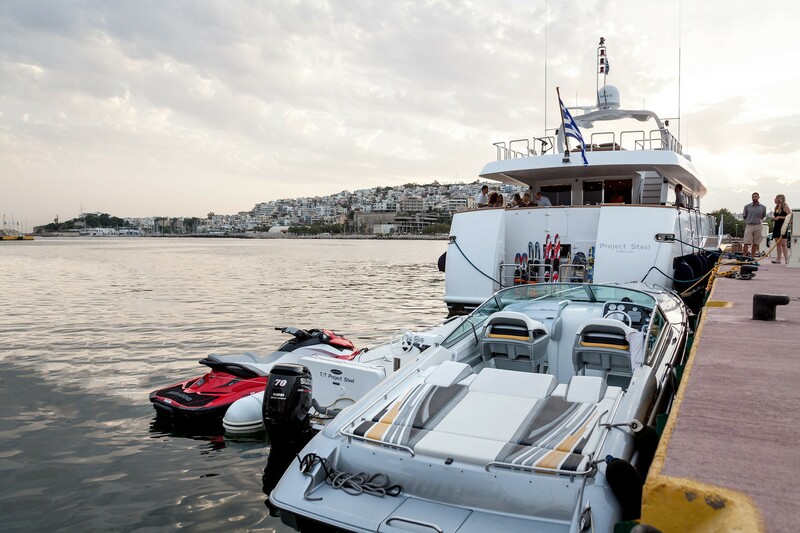 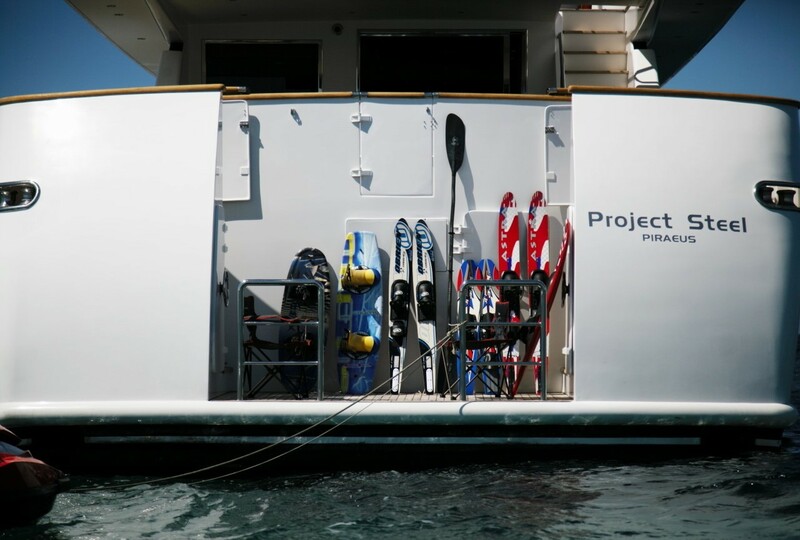 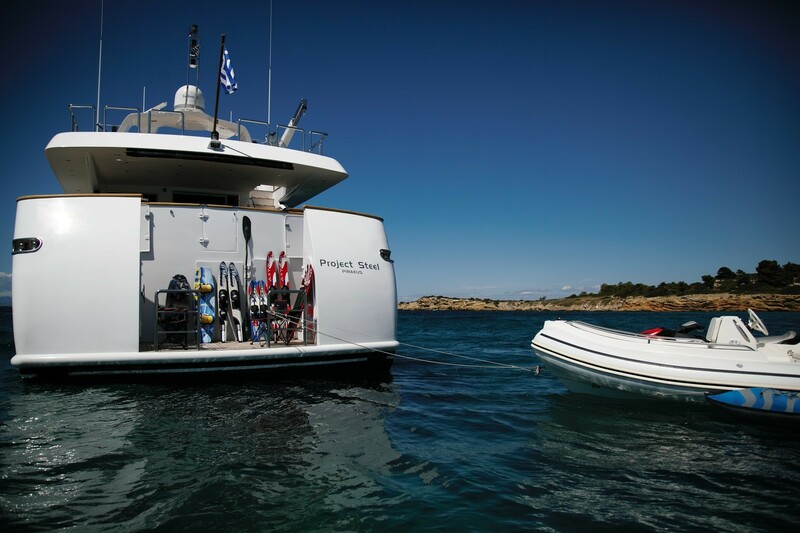 PROJECT STEEL is fitted with stabilizers, ensuring a comfortable luxury charter yacht experience. 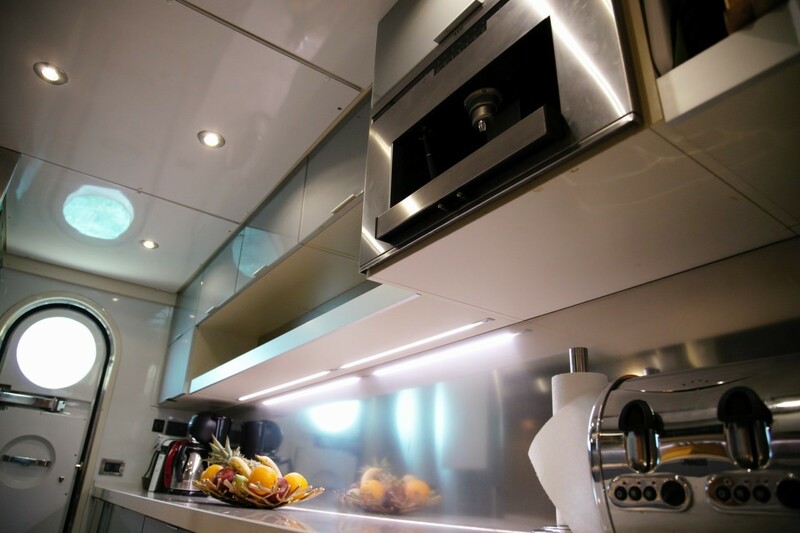 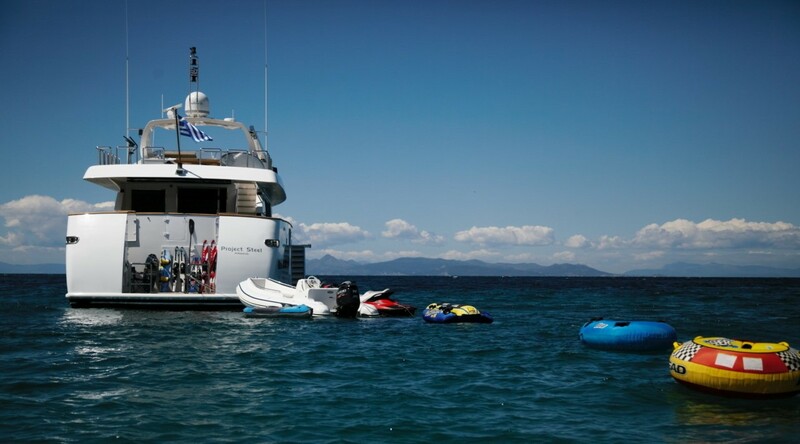 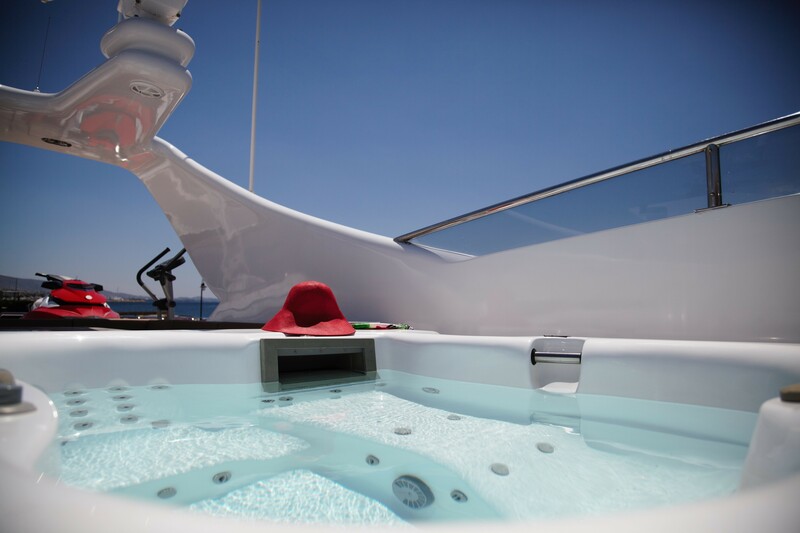 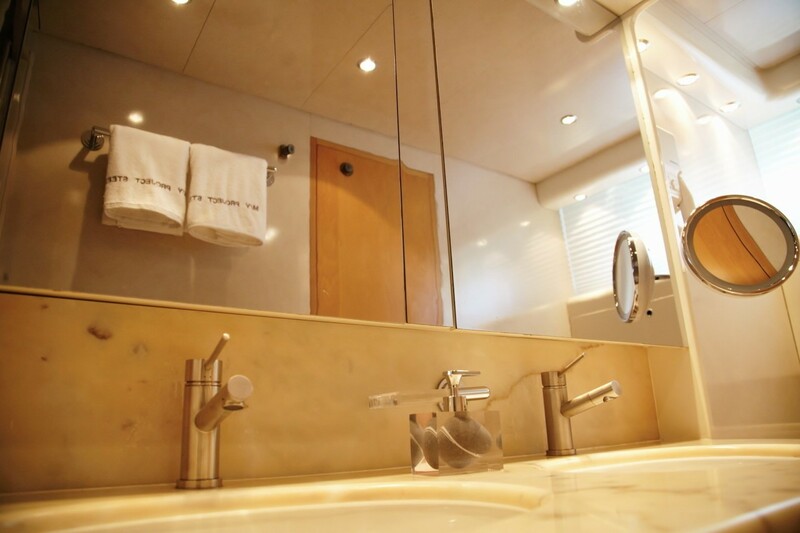 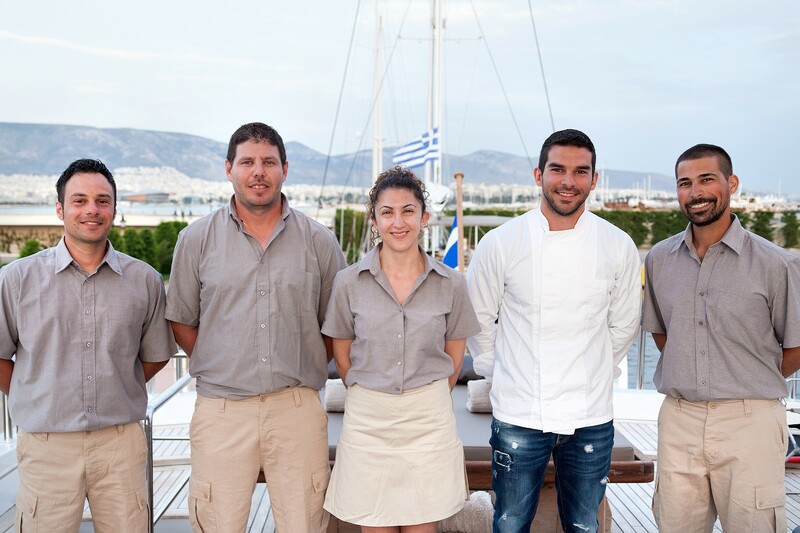 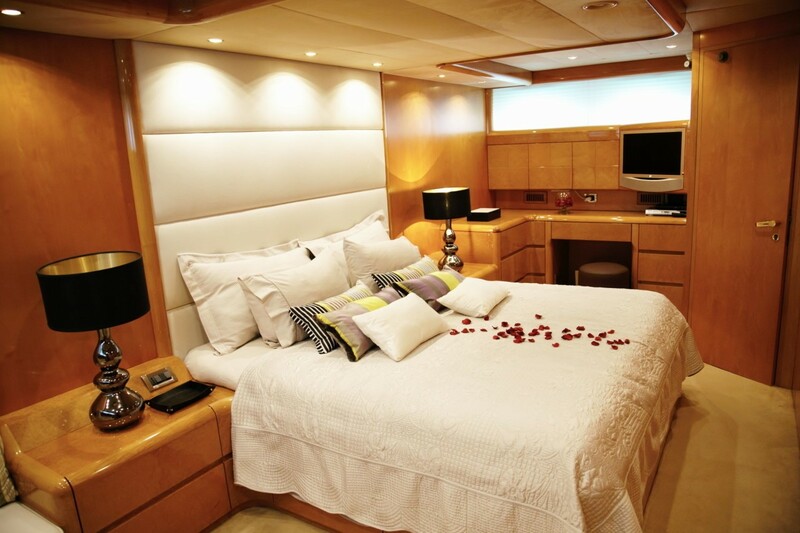 The PROJECT STEEL yachts offers yacht charter accommodation for 12 guests in 5 en-suite cabins. 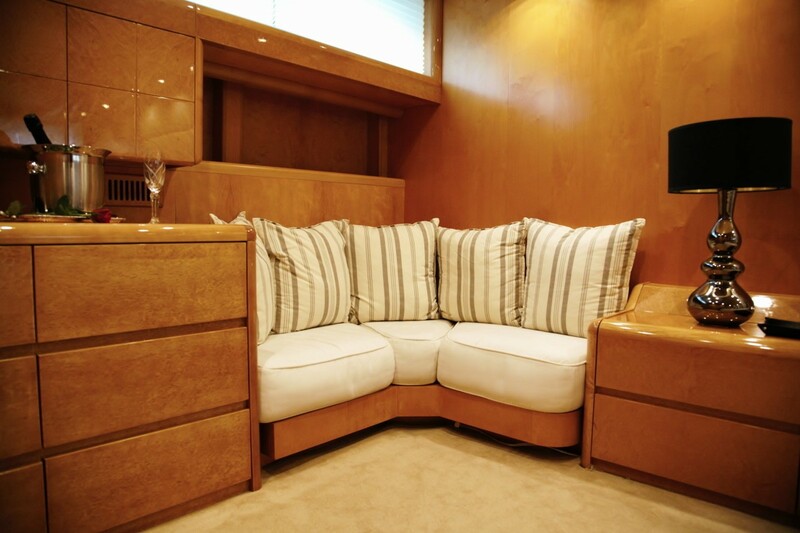 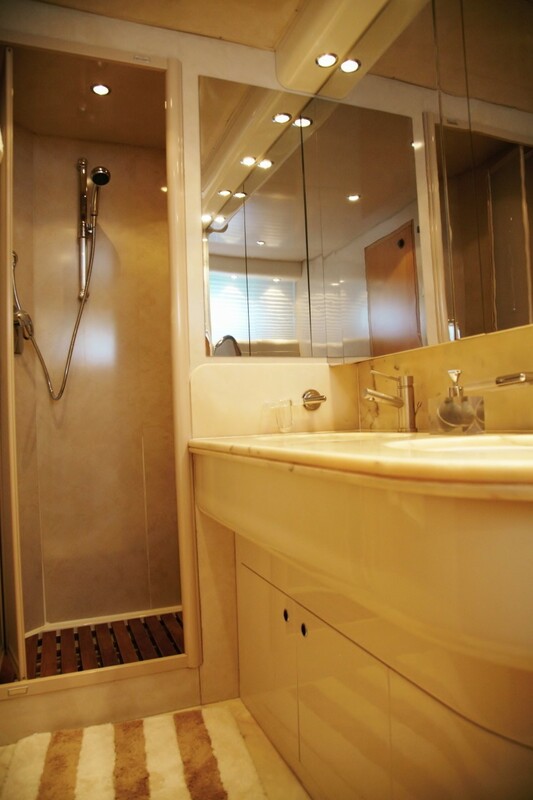 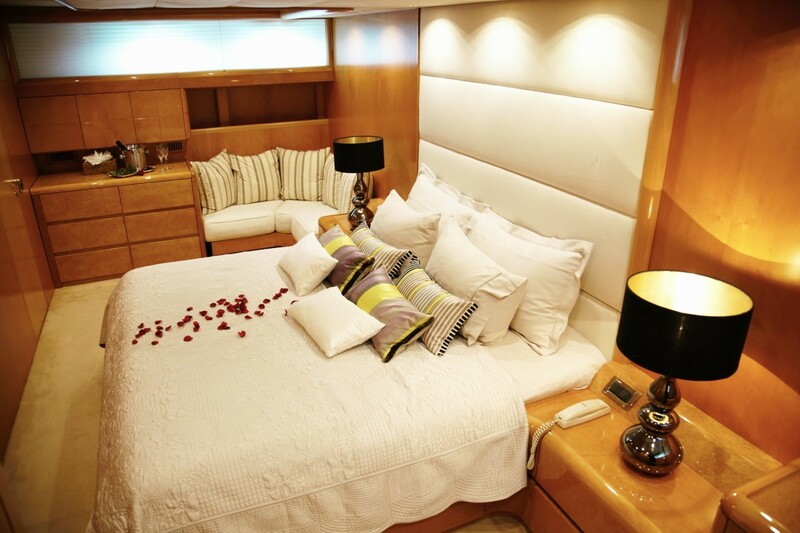 The master suite is below decks amidships, with a center lined king size bed, love seat and vanity. 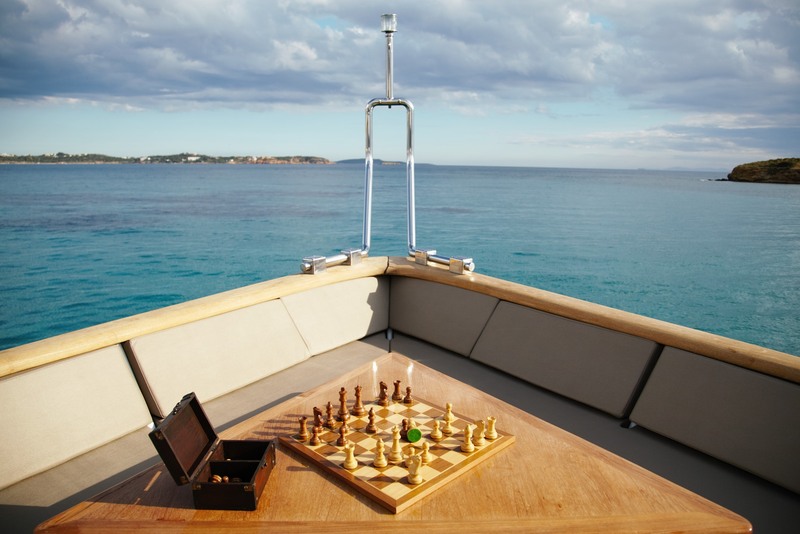 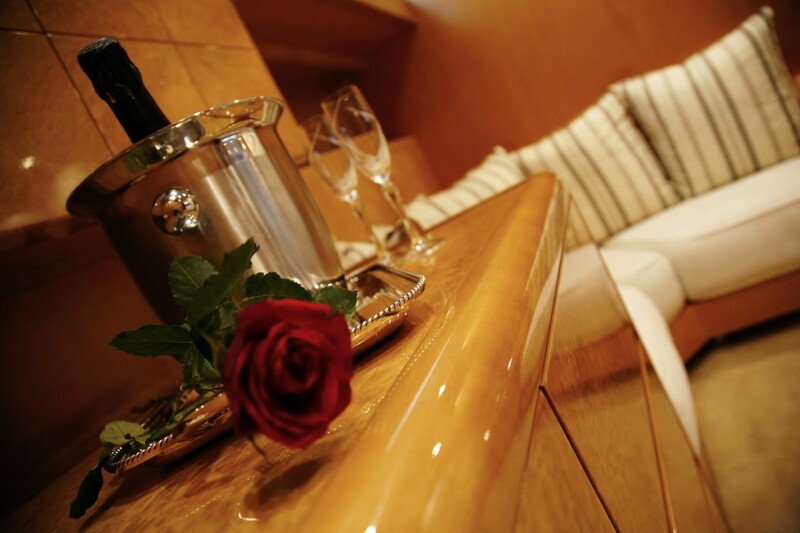 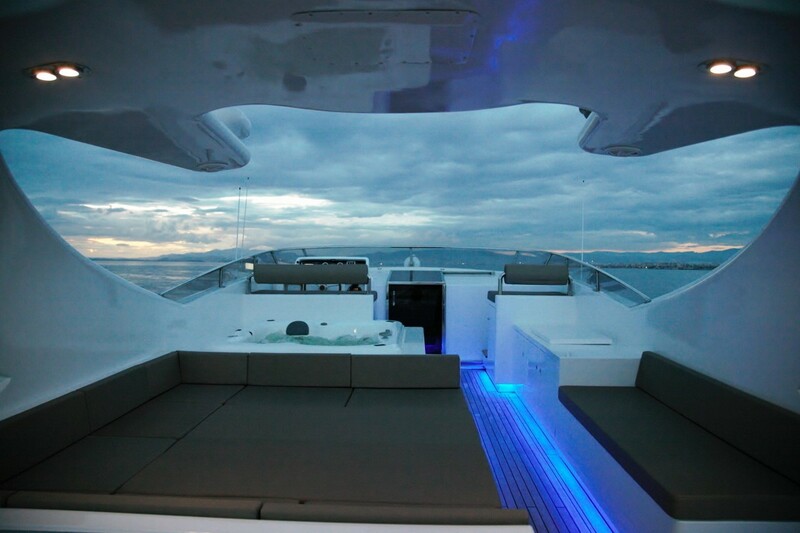 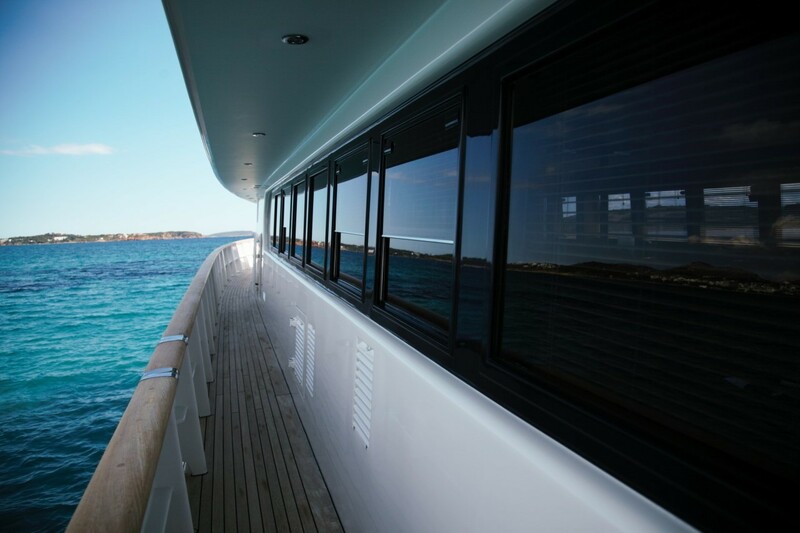 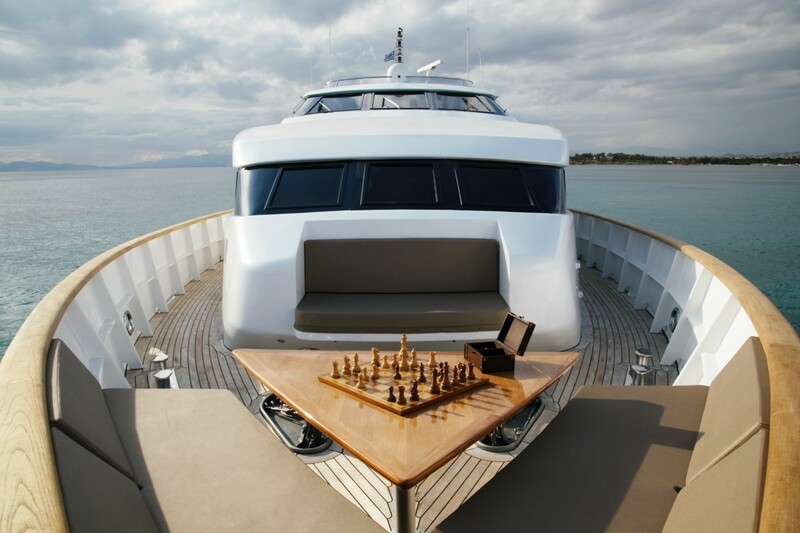 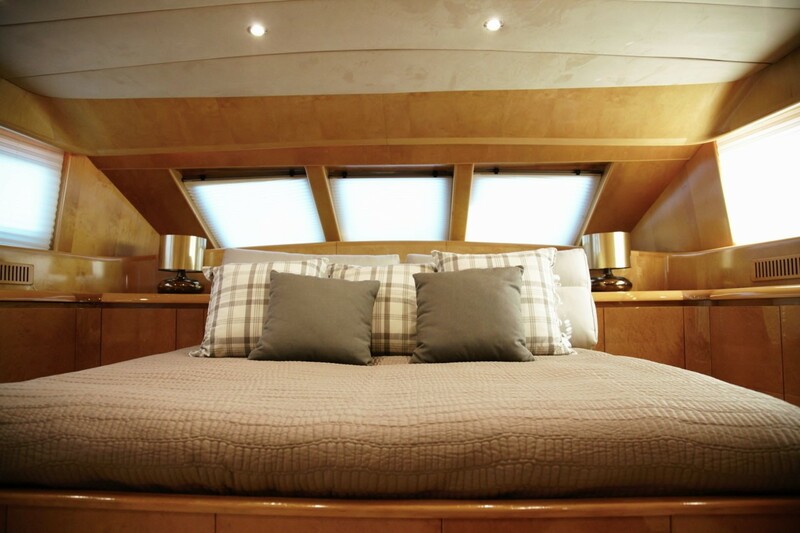 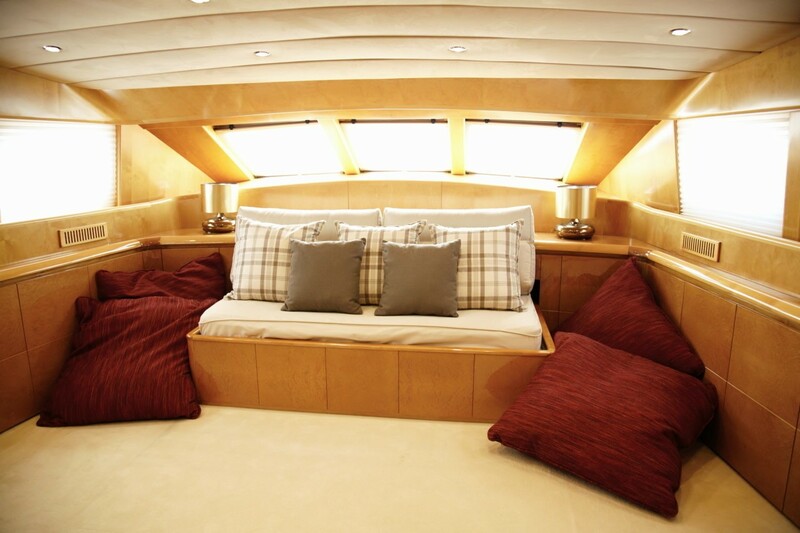 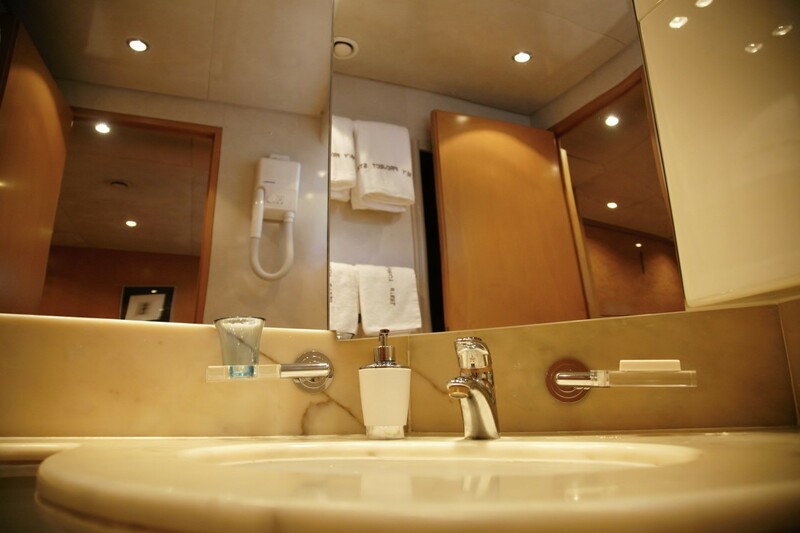 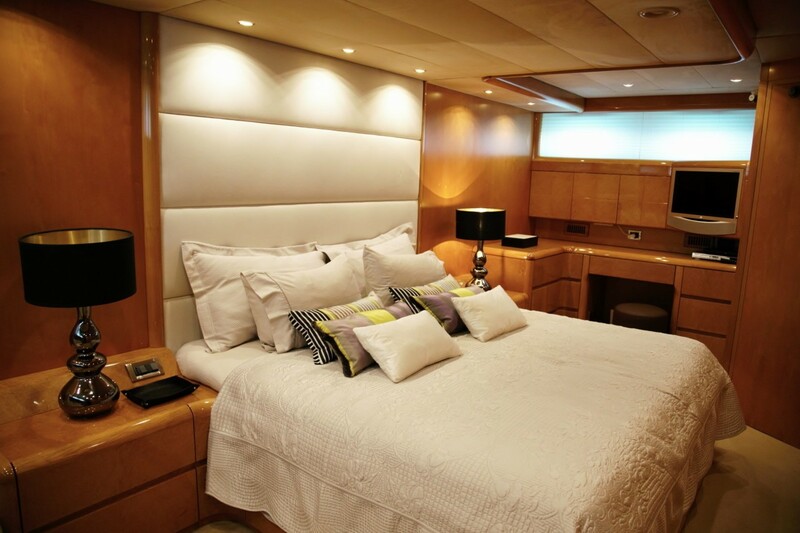 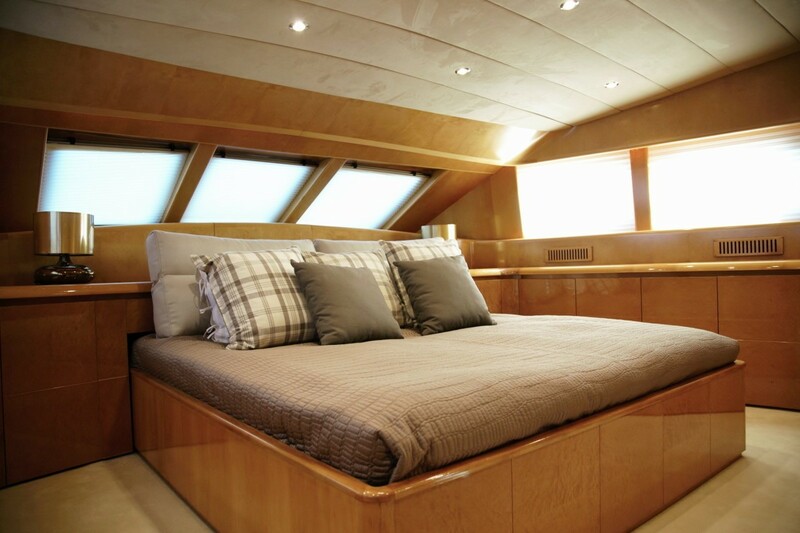 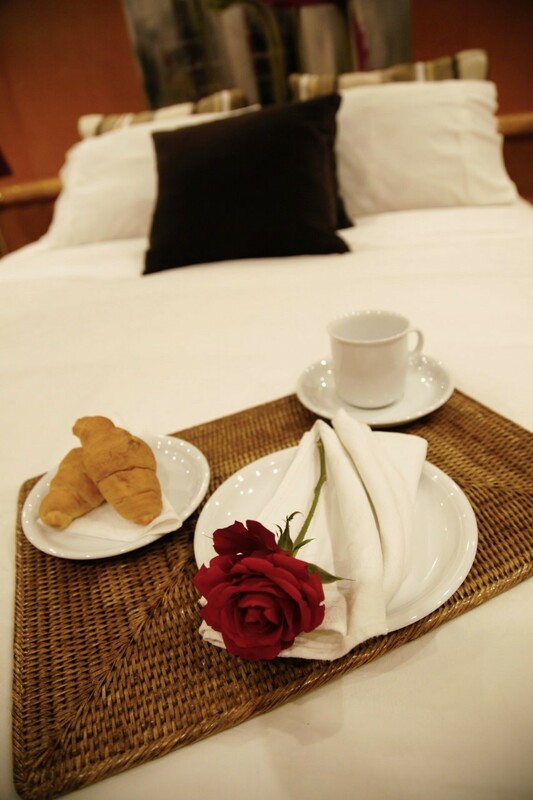 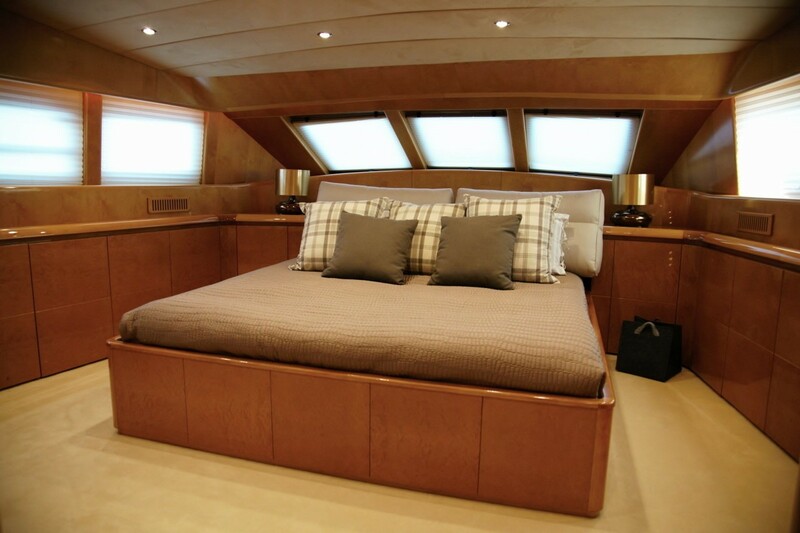 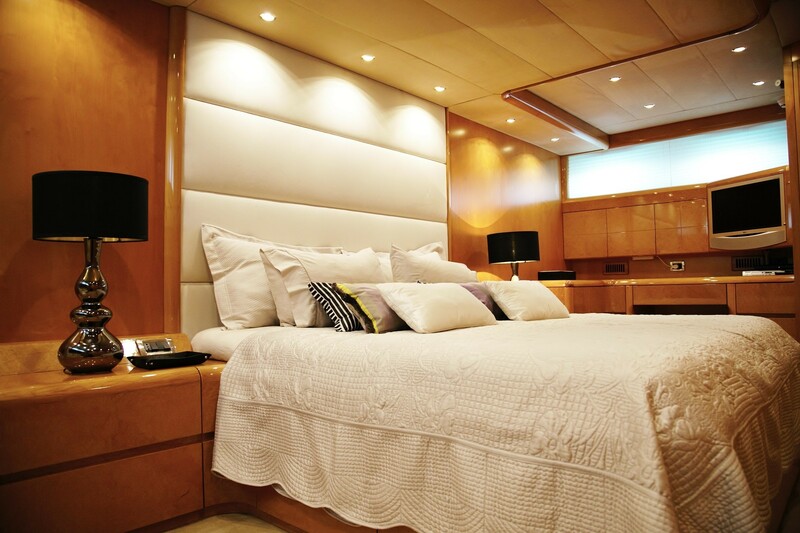 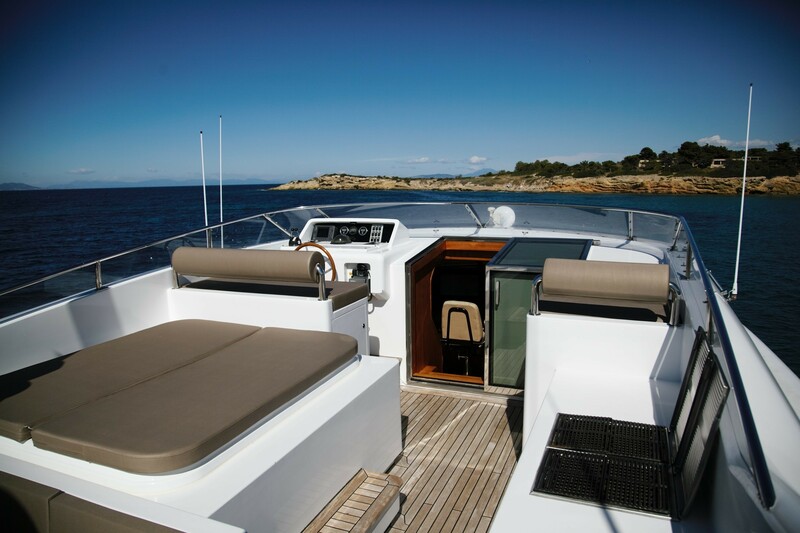 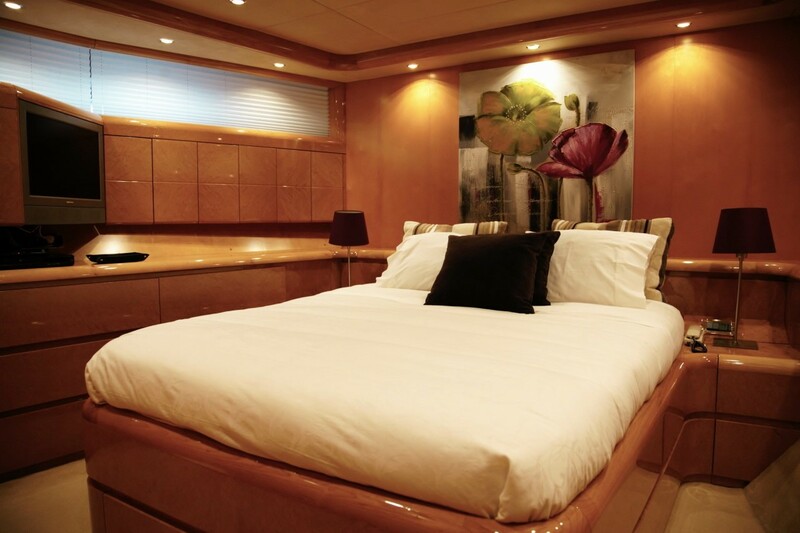 The VIP cabin is on the main deck, forward and full beam of the yacht, with a center lined queen size bed. 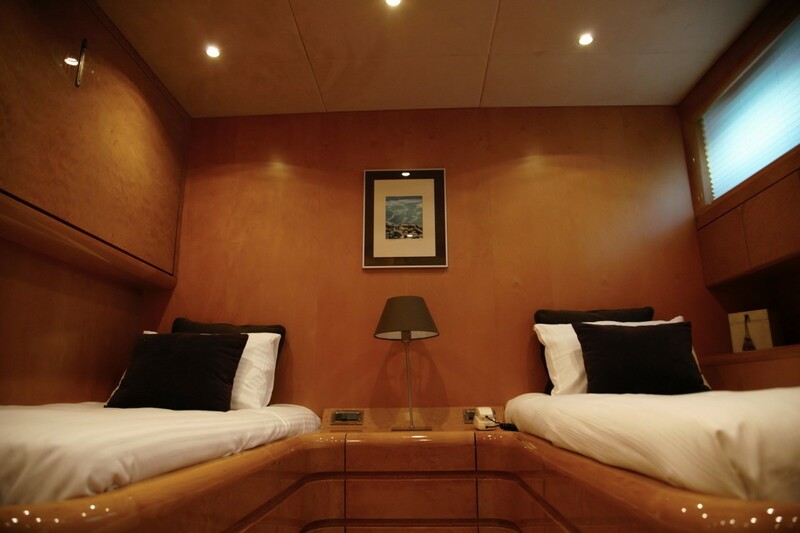 Below decks a guest double cabin offers a double bed, while 2 further cabins have side by side twin beds. 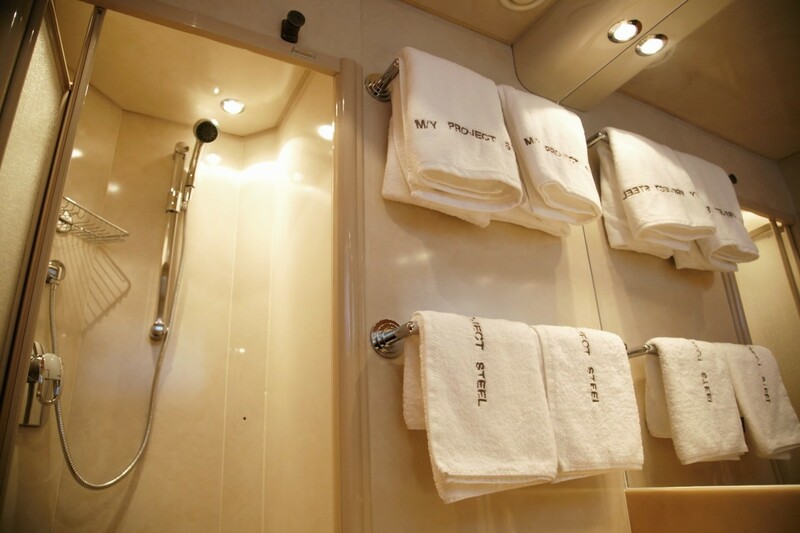 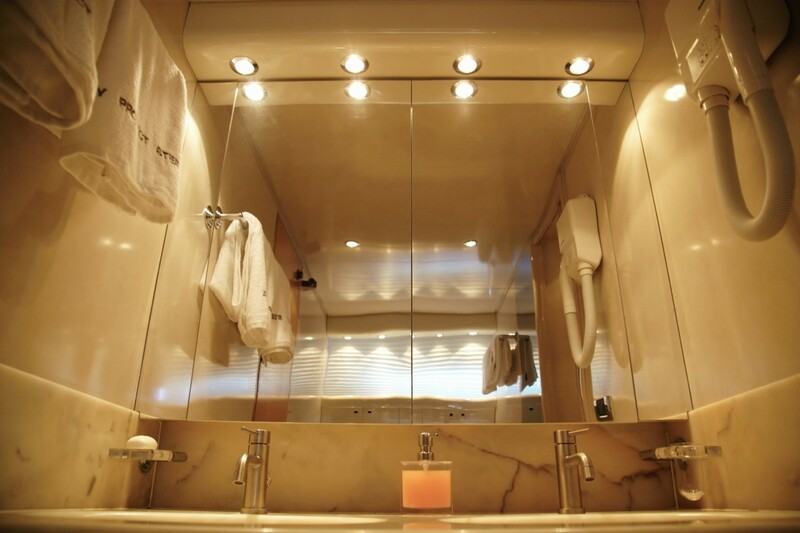 Two additional guests can be accommodated in the twin cabins, both with a single upper Pullman each.